The Balkans are made up of some of the most fascinating, beautiful, interesting countries that I have ever been to. In 2018 I decided to ditch my travel plans and head for a Balkans travel adventure to experience this mysterious part of Europe that I kept hearing about from friends. 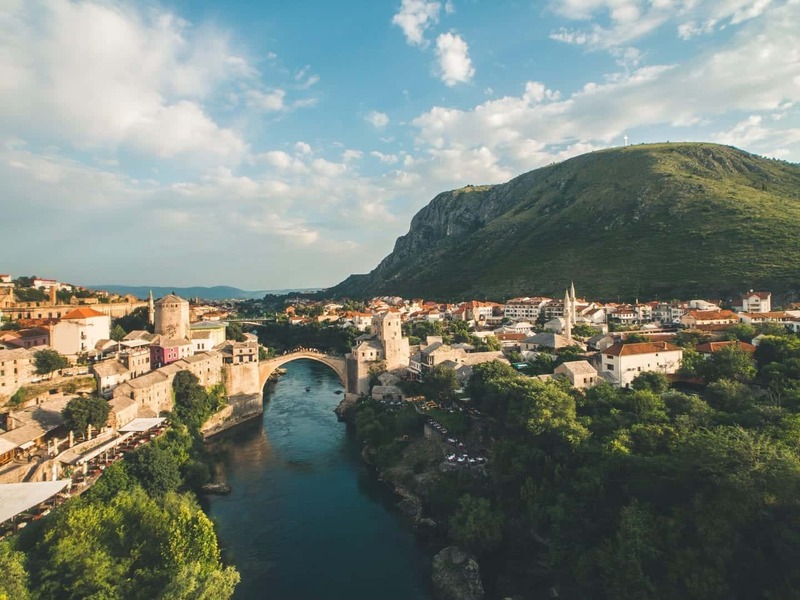 I had heard a few things about the Balkans and the beauty of its regions but never made plans to visit – until one random day when I decided to book a flight to Bosnia. I knew nothing and to be honest, couldn’t find a lot online about it either, which always fascinated and excited me. It’s hard to find a lot of information about Balkans travel that’s factual and up to date. As it’s such a fast-growing region of Europe and Balkan’s tourism is starting to take off, things can change like a flick of the switch. 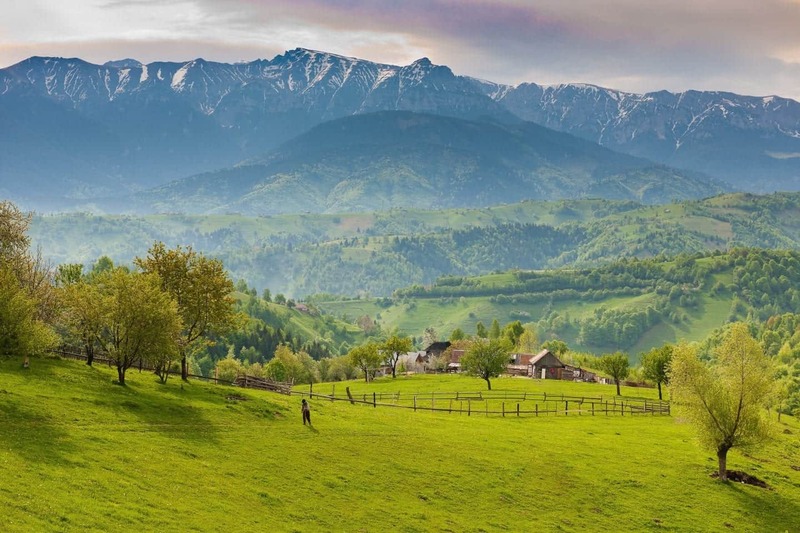 Here’s everything you need to know about Balkans travel! 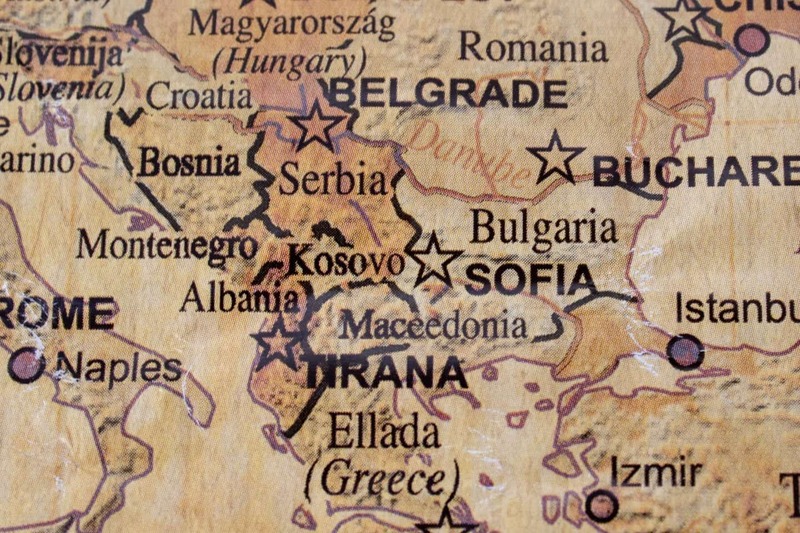 The Balkans Region: Where are the Balkans? The Balkans consist of 12 countries. To this day, the Balkans region is often underestimated, and some people do not count countries such as Slovenia and Turkey as part of the Balkan peninsula but in fact, they are. Although the entire country does not lie on the peninsula, a part of it does which means its technically Balkans! Many people think that the former Yugoslavia is the Balkans today which is also not true. There are countries that were not part of Yugoslavia like Albania, Romania, Bulgaria and Greece. There are plenty of ways to get to the Balkans, and cheaply! Travellers these days can grab extremely affordable flights to cities like Skopje (Macedonia), Bucharest (Romania), Athens (Greece), Tuzla (Bosnia and Herzegovina), Sofia (Bulgaria), the list goes on! Once you’re within the Balkans you can easily move around via bus or (some countries) by train. A great option for Balkans travel is to hire a car to experience all the small regions and villages that you might miss via bus or train. Catching buses is the best option (and sometimes the only) when travelling the Balkans. Usually, you will pay for the ticket and then extra for any luggage you have that must go under the bus so remember to always have a few coins handy. Buses are a fantastic way to see the country and you will not be disappointed with the views that you are blessed with. Hiring a car is the best way to travel through the Balkans because you can visit some beautiful places off the tourist trail. Make sure you check with the rental company that you can take it to multiple countries. Also, check with each countries rules. For example, in Albania and Montenegro, you must always have your lights on. Balkans travel can be fun, exciting, stressful and fascinating all at the same time! The Balkans is great to visit all year round. The busiest time is obviously Summer, but I love visiting any of the Balkan countries in spring. This is when the flowers bloom, the weather is slowly getting warmer and in (some countries) the prices are even cheaper than they already are. For countries like Montenegro and Albania, the tourist season is July/August and usually, prices rise for that period of time. This is why I love visiting at other times of the year because not only do you have tourist destinations to yourself, but you really get to feel the country like a local and not a tourist. The Balkans is a fascinating place because the cultures and history are still so rich. To travel the Balkans, you have to go with the flow and expect the unexpected. That is the charm of the Balkans travel. Things are not as organised as elsewhere in Europe; bus timetables are sometimes hard to come by unless you ask a local and planning ahead can be difficult. My one piece of advice is to just relax and see where the Balkans takes you. Have a rough idea of where you want to travel to in the Balkans but don’t make any concrete plans! Another important piece of advice is to travel slowly. Many people think they can whack the Balkans out in a couple of weeks. The Balkans are made up over 12 countries and to experience a whole country in a couple of nights is not a good idea. There is so much to see, learn and experience! Each country has its own unique culture, beautiful landscapes and food to try, so really take the time to experience a few at a time. Don’t just hit up the capital cities of a few Balkan countries. Pick 2-3 different destinations within the country to see a range of places! One of the questions I am asked again and again about this region of the world is if it’s safe to travel there. The Balkans have experienced troubles in the past, but those are in the past. The Balkans is a safe place to travel, even alone as a female. I have travelled extensively over this region, by myself, and never had any troubles. The only thing I experienced is incredible hospitality! I now live in Albania, a country which many refer to as one of the most dangerous, thanks to the movie Taken. I can confirm that it’s not what you see in the movies. It’s safe, the Balkans people are friendly, and it’s not full of mafia bosses and drug lords. This is the same for all the other Balkan countries. 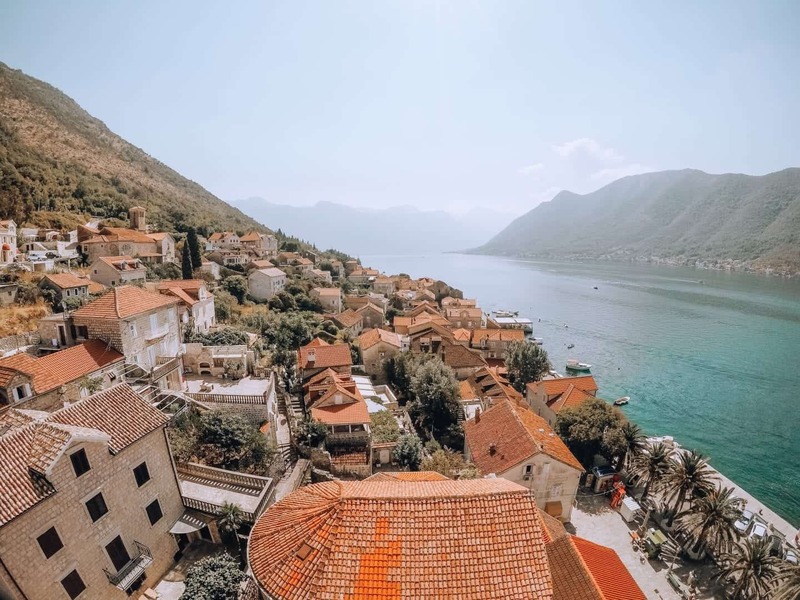 Here are some of the best places to visit in the Balkans that I personally recommend as well as other travel bloggers! Croatia is an incredibly beautiful place with many islands, seaside towns and relaxing places to visit. It’s also one of the more popular and expensive countries to visit within the Balkans. Croatian tourism has risen incredibly over the last 20 years. Visit out of season so you’re not bombarded with other backpackers and travellers and get to enjoy this country without the craziness. For example, Dubrovnik has seen an influx of visitors over recent years due to it now being a popular cruise ship stopover. In the summer the city is full and it can be hard to get accommodation. I visited in March and was pleasantly surprised at how quiet it was. The locals told me that to get to the centre of the old city from one of the gates it takes around 5-10 minutes in the off-season, and during the summer it can take them an hour! Transportation: The most popular way to travel is by bus. There are also trains, and of course, ferries, if you want to travel to the islands. Can you drink the tap water in Croatia? Yes! Accommodation in Croatia: There are a range of great hostels and hotels throughout the country depending on your budget. Another great option is Airbnb (Get your free $35 credit here). Often overlooked by its famous sister, Split, just 30 minutes away, Omis is a sweet getaway from the bustle while offering a lot. Omis is a little hidden adventurers dream. Sure it has the charming old medieval town sprinkled with stone-built homes and shops all tightly fitted in a town square like most Balkan cities do but just beyond this, there are some sure thrills to be had. 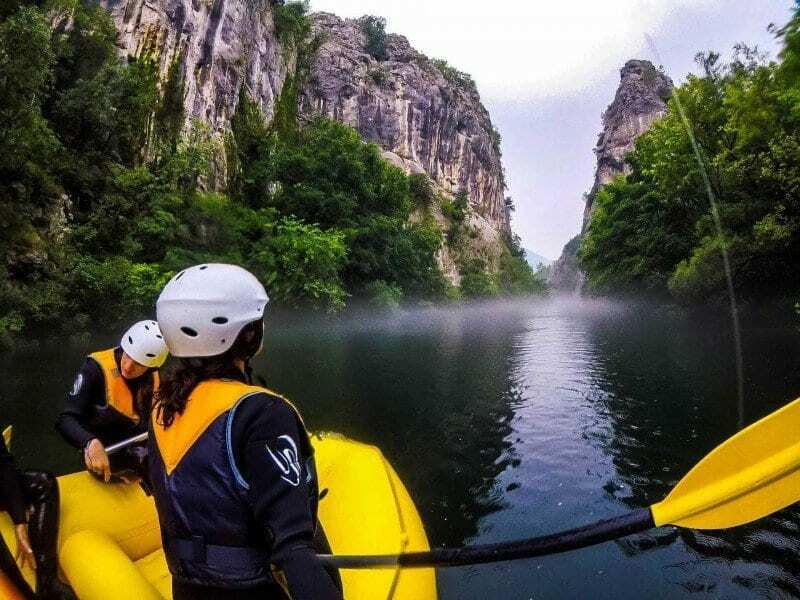 Zip lining over the Cetina River on an eight-line course is totally epic, but if you want to keep it on ground level, you can go canyoneering or white water rafting down the same river! If you want to keep it on the coast, grab a kayak and just go. Impressed by the gigantic grey mountain in front of you? Go rock climbing! At the end of the day, the black sand beach just a few minutes from the square will be waiting for you to chill on. Where to stay in Omis: If you’re a backpacker try Hostel Omis. If you’re looking for private accommodation, then check out Plaža Duće located right on the beachfront with the most beautiful view! Edgy, sophisticated, and with a history that dates back to Roman times, Zagreb is one of the most fascinating places to visit in the Balkans. Croatia’s capital is located in the country’s central-northwest, an area many people skip over on their way to the Dalmatian Coast or Istria. Zagreb is more than worthy of a few days of your time, especially if you’re interested in history and architecture. Historically, the area Zagreb now occupies was divided into two hill-top villages: Kaptol and Gradec. The Zagreb of today is anchored in Ban Jelacic Square, named in honour of the army general who united the two villages to form the city in 1851. The historic Upper Town is dominated by the Gothic-style Zagreb Cathedral. The city’s most iconic building, St. Mark’s Church, which bears two coats of arms on its roof in a colourful display of Zsolnay tiles, is nestled amongst 18th and 19th-century Austro-Hungarian facades. Other attractions in central Zagreb include a wonderful green market, Tkalciceva Street, a pedestrian street lined with open-air cafes and bars, and off-beat attractions such as Tunnel Gric, a WWII-era bomb shelter cleaved from the city’s foundations. Downtown, Lenuci’s Horseshoe—a U-shaped string of parks and green spaces—is the perfect place for a stroll. Zagreb has a wealth of museums and galleries to visit (apparently the most museums per capita of any city in the world), including the famous Museum of Broken Relationships. My favourite place in Zagreb is Miragoj Cemetery, a gorgeous mausoleum and park with Neo-classical arcades and cupolas. Zagreb is serviced by the Franjo Tudman International Airport, with daily flights to and from most of Europe and beyond. Zagreb can also be reached overland by train or bus from elsewhere in Croatia or any of its neighbouring countries. Where to stay in Zagreb: If you’re a backpacker try Mali Mrak Hostel. If you’re looking for private accommodation, then check out Palace Hotel located right in the centre! Usually overlooked for the larger and most bustling city of Dubrovnik, the Croatian city of Split should not be missed on your next trip to the Balkans. 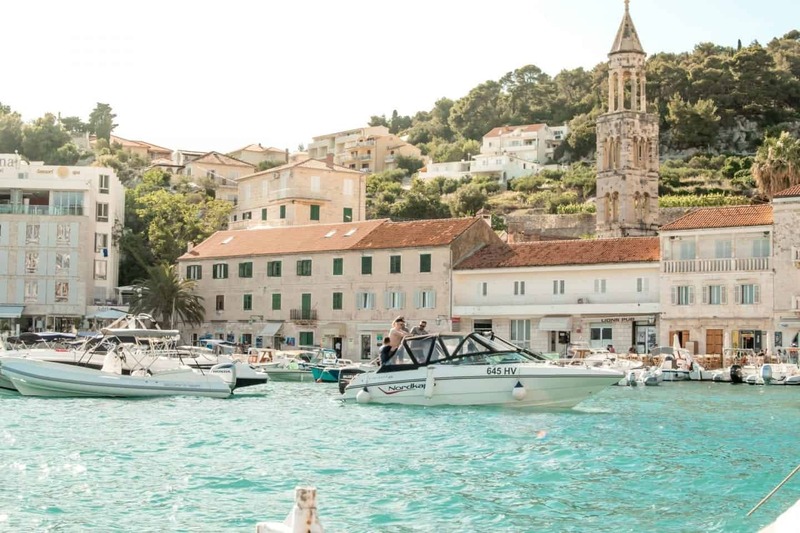 A hidden gem located right on the Adriatic Sea, the city is still relatively unknown by tourists and the stepping stone for reaching some of Croatia’s most beautiful islands. Only four hours from the capital city of Zagreb, the city is easily reached by car, bus, plane, and even boat! When in Split, you must visit Diocletian’s Palace. Now encompassing over half of Split’s Old Town (I actually slept in part of the palace! ), Diocletian’s Palace was the retirement home for the Roman Emperor Diocletian and now a UNESCO World Heritage Site. It’s well worth exploring Diocletian’s Palace and the entire Old Town during both the daytime and nighttime hours. I highly suggest purposely getting lost on some of the side streets – they are absolutely photogenic! Besides relaxing at the beach or taking a day trip out to one of Croatia’s gorgeous islands, history buffs will absolutely love Split! 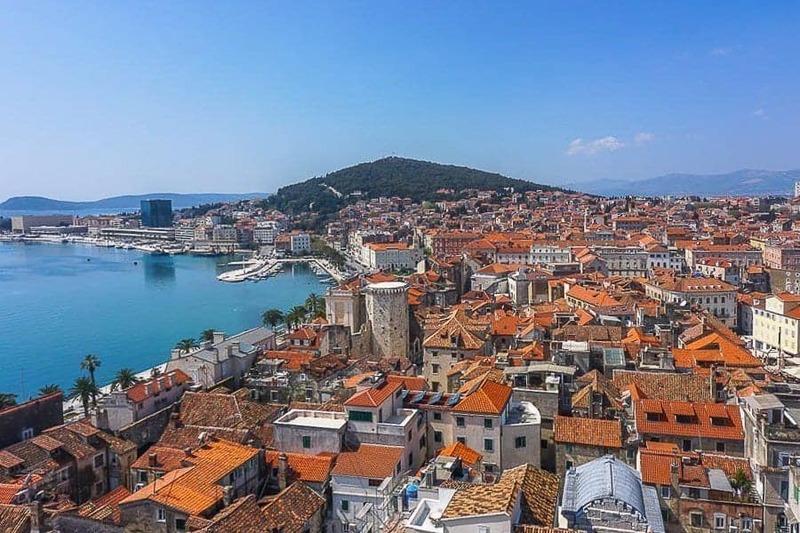 After changing rule close to a dozen times, Split’s history is a mix of cultures, best reflected in the many museums spread around the city including an Archeological Museum, City Museum, Ethnographical Museum, Maritime Museum, and Fine Arts Museum. Split is brimming with culture and should not be missed on your next trip to the Balkans! Where to stay in Split: If you’re a backpacker try Split Hostel & Guesthouse. If you’re looking for private accommodation, then check out Perla Apartmani located right in the centre with a lovely view. The Elaphiti Islands in Croatia is a great place for a beach holiday, but it can also be done as a day trip from Dubrovnik, as it is only a 40-minute ferry ride away. You can also book a private charter, which is more expensive but gives you the chance to see more of the coastline. The Elaphiti Islands have several beaches without the great crowd, other parts of Croatia experience in the high season. Sunj Beach on Lopud Island is a sandy, shallow beach, which makes it perfect for families with young children. There is a possibility to rent jet skis or kayaks here. Exploring Croatia by kayak is a fantastic way to see hidden bays, secluded beaches and go cliff jumping. Off the coast of Sipan Island, there is an underwater cave, which can only be reached by kayak. 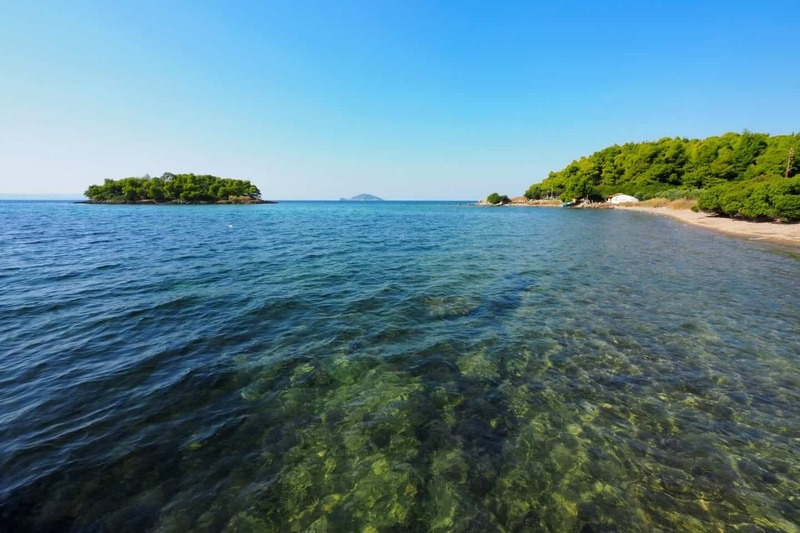 Two of the Elaphiti Islands (Lopud and Kolocep) are car-free. Imagine what a peaceful environment that creates. Everything can be reached by walking or you can get around by taxi golf carts. One of the most beautiful places to visit in Croatia, and in the Balkans as a whole, is the amazing Plitvice Lakes National Park. In the centre of Croatia, around two hours from both the capital Zagreb and the coast, it makes a great day trip or stop on a tour of Croatia. The centrepiece of the National Park is the lakes themselves. Sixteen separate lakes are joined by stunning waterfalls – some huge and torrential, others so small they’re a trickle underneath the boardwalks that take visitors around the park. The whole place is an amazing, watery wonderland, and is gorgeous at any time of year. In the spring and summer the lakes are a bright turquoise backed with lush green forests, in the autumn the foliage creates a stunning display of colours, while in winter the park is often covered in snow and the waterfalls freeze. 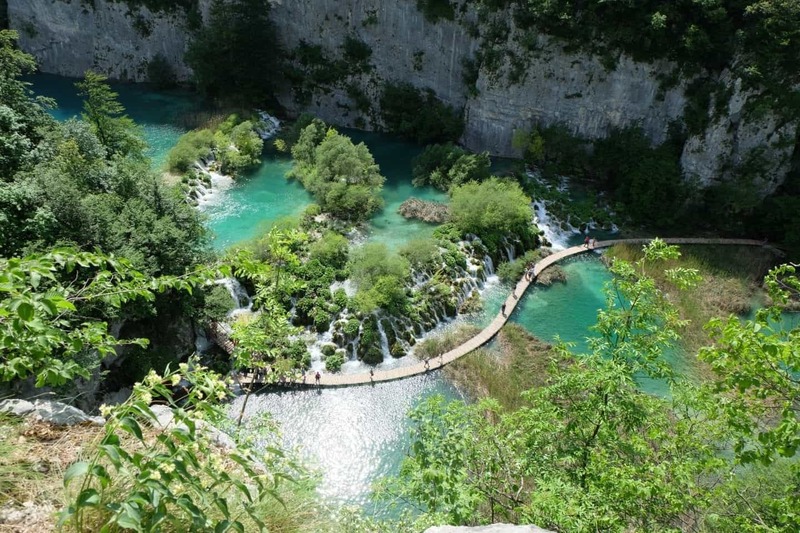 Visiting the Plitvice Lakes is a must when you’re in the Balkans! Where to stay in Plitvice Lakes: If you’re a backpacker try Falling Lakes Hostel. If you’re looking for beautiful private accommodation, then check out Ruhige Lage 1, a great bed and breakfast within the national park. Dubrovnik is an incredibly beautiful and popular place to visit in Croatia. Many refer to this city as the city of The Game of Thrones as many scenes were filmed in this city. I personally haven’t watched the show and enjoyed Dubrovnik immensely. I even wrote a guide on Dubrovnik for people who haven’t seen GOT. I highly recommend taking the time to walk through the old city and take in the beautiful architecture of the place. If you want a beautiful view you can take the cable car or walk up to Srd Hill. When you get to the top walk to the left side near the museum. Here you can get a great view, without the crowds. This is where many photographers get their beautiful pictures from! 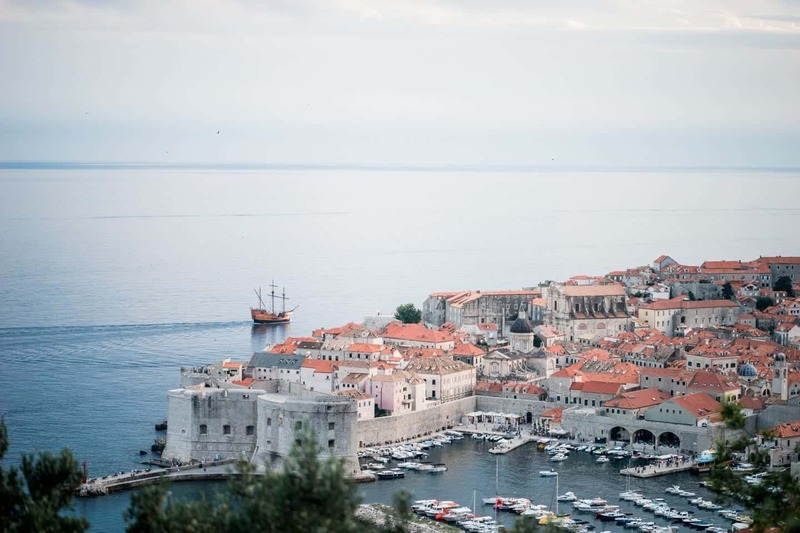 Where to stay in Dubrovnik: If you’re a backpacker try City Walls Hostel or Old Town Hostel. If you’re looking for beautiful private accommodation, then I highly recommend Celegna Studio Apartments located right in the heart of the old town. 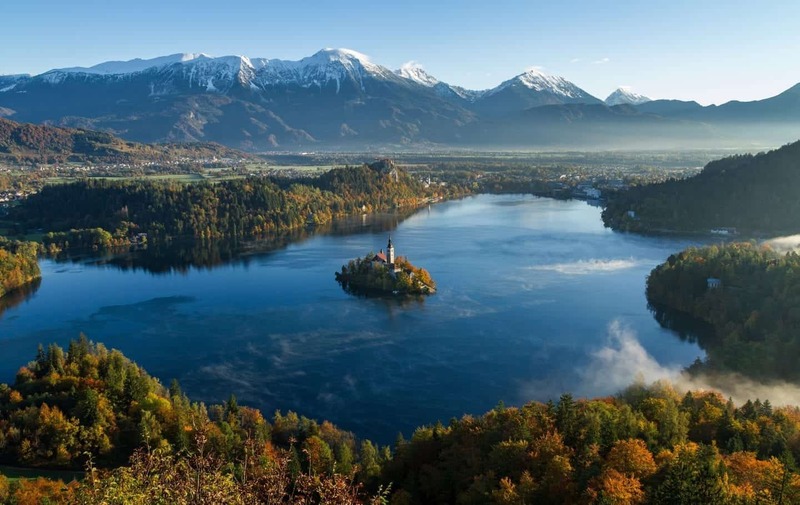 Slovenia is known for exceptional views and having the greenest capital in Europe! Slovenia is one of my favourite countries in Europe because it’s a great place if you want to reconnect with nature. The National park, wine regions and lakes will blow you away. The country is very affordable so if you’re a backpacker you will love Slovenia for its prices. The food is hearty and incredibly tasty. I highly recommend checking out the wine region Goriška Brda which has been named ‘The Tuscany of Slovenia’. Transportation: My top recommendation for travelling around Slovenia is by bus or car. I travelled by car and got to visit some incredibly beautiful places that I wouldn’t have been able to reach by bus. Can you drink the tap water in Slovenia? Yes! Accommodation in Slovenia: There is a range of great hostels and hotels throughout the country depending on your budget. Another great option is Airbnb (Get your free $35 credit here). 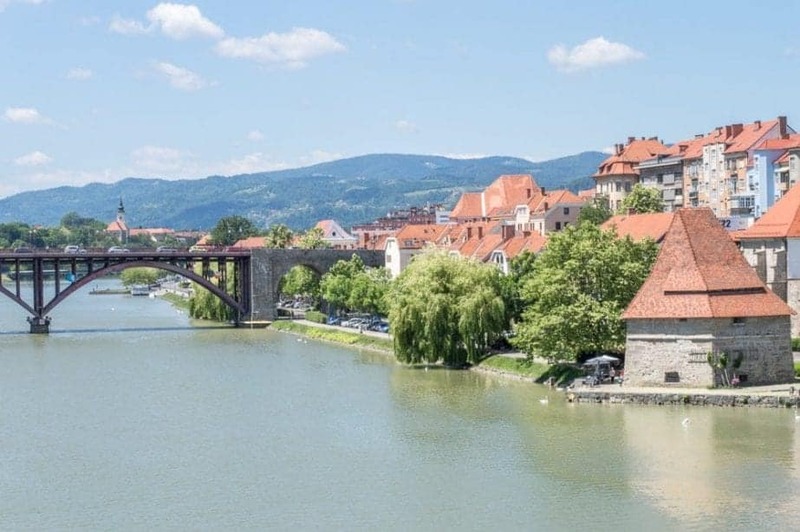 Located in north-eastern Slovenia in the region of Lower Styria, the city of Maribor can easily be described as the gateway to the Balkans. Often overlooked for Ljubljana and Bled, Slovenia’s second-biggest city actually has plenty to offer. Some of Maribor’s most notable sights include Maribor Cathedral, Maribor Castle, and the Franciscan Church of St. Mary. Its city center is also the perfect place to explore a beautiful mix of architecture, blending styles such as Gothic, Baroque, and Neoclassicism. Finally, check out the Lent district on the Drava river with the Water Tower and the Judgment Tower. Although the city has much to offer, Maribor is best known for its wine tradition. In fact, it is home to the oldest still existing grapevine in the world, also known as the Old Vine. You can visit the Old Vine House and learn about its history. Then, head out into the countryside to sample some of the region’s beautiful wines. While you’re there, plan a stop at the village of Svecina and keep an eye open for its famous heart-shaped road. Where to stay in Maribor: If you’re a backpacker try 4 Rooms or Uno Youth Hostel. If you’re looking for beautiful private accommodation, then I recommend Hotel City located right in the centre. The pastel candy-colored buildings, laid-back attitude, and sparkling turquoise water of Piran make it a must-visit in the Balkans. When the former Yugoslavia broke up, somehow Slovenia only got 47 kilometers of coastline, while its neighbor Croatia got the rest. That makes Piran even more special, because it’s an area that flies under the radar. 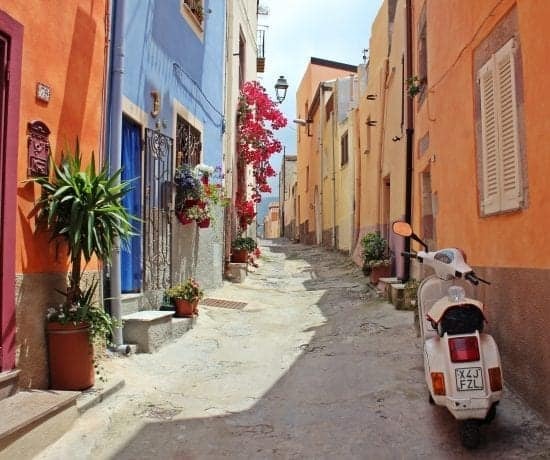 It’s a quiet little Italian-feeling pocket of seaside that you will fall in love with. In Piran it’s less about things to do, and more about just enjoying. Wander the little streets and alleys, shop the art galleries, climb the church tower, and have a lazy fresh seafood lunch right on the water. 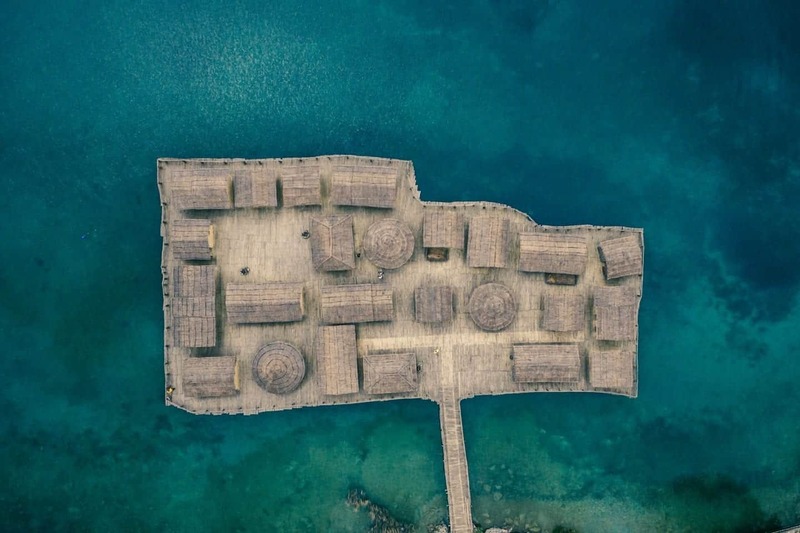 While you’re there, make sure to purchase some local sea salt—it’s harvested using a technique over 700 years old and has the same stringent regional requirements as Parma ham and champagne. There are Slovenian wineries in the nearby hills that pair nicely as a day trip as well. As with most Slovenian destinations (it’s a small country! ), Piran is an easy day trip from Ljubljana. The easiest way to get around Slovenia is to rent a car, but there are also ferries from Venice and Rovinj, and buses from Trieste and Ljubljana. Read more about visiting Piran! 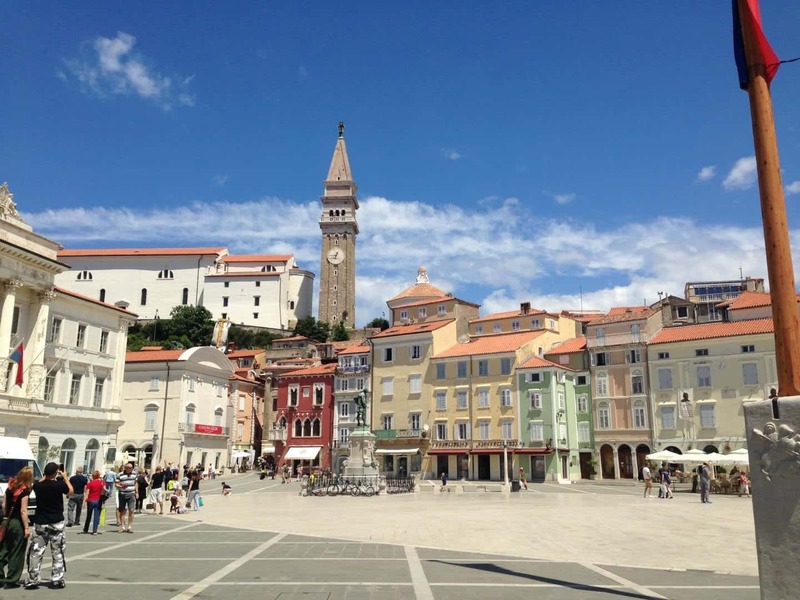 Where to stay in Piran: If you’re a backpacker try Youth Hostel or Hostel Pirano. If you’re looking for beautiful private accommodation, then I recommend Barbara Piran beach hotel and spa. Probably the most famous destination within Slovenia is Lake Bled, known for the beautiful island in the middle of the Lake Bled. This part of Slovenia is very peaceful, as long as you visit out of season. As this is a very tourist hotspot you can expect the prices to be a little higher. If there’s one thing you should try here, it’s the Bled cream cake. This is a pastry filled with Vanilla cream, whipped cream and a layer of crispy pastry, topped with icing sugar – it’s as delicious as it sounds! Another great thing to do in Bled is to hire a kayak and kayak to the little island within the lake. Where to stay in Bled: If you’re a backpacker try Travellers’ Haven. If you’re looking for beautiful private accommodation, then I recommend Wellness Essence, a beautiful apartment with an incredible view! 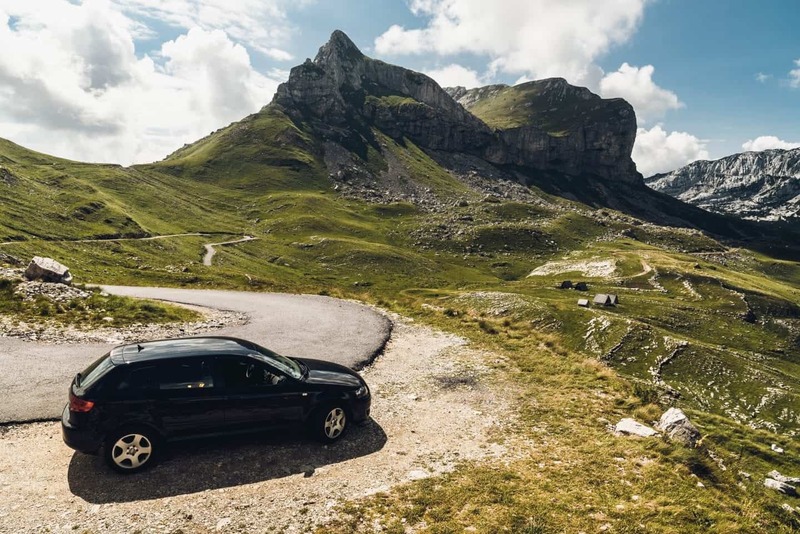 If you can hire a car and visit all the beautiful places within the Triglav National Park, I promise you it will be one of the most memorable parts of your trip. There is so much to see and do in this national park and a number of places where you can relax and stay in for a few days. Hiking is the most popular activity to do within the park. Hiking to the summits of the Julian Alps is one of the most rewarding things to do here. I also recommend doing the Soca trail, a 25km walk that leads you to the source of the Soca river. There are a number of incredible (and free!) things to do in Slovenia which I recommend here. 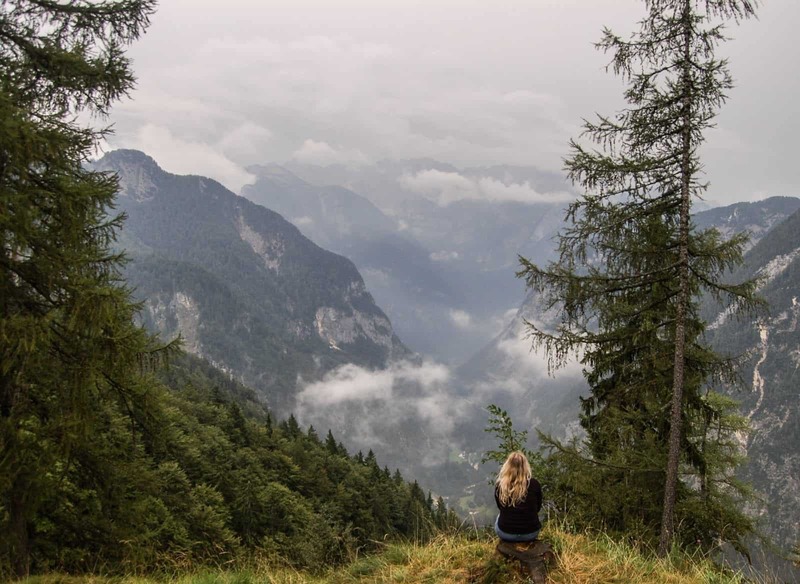 Where to stay in Triglav National Park: If you’re looking for beautiful private accommodation, then I recommend Pristava Lepena, or House DorMica. 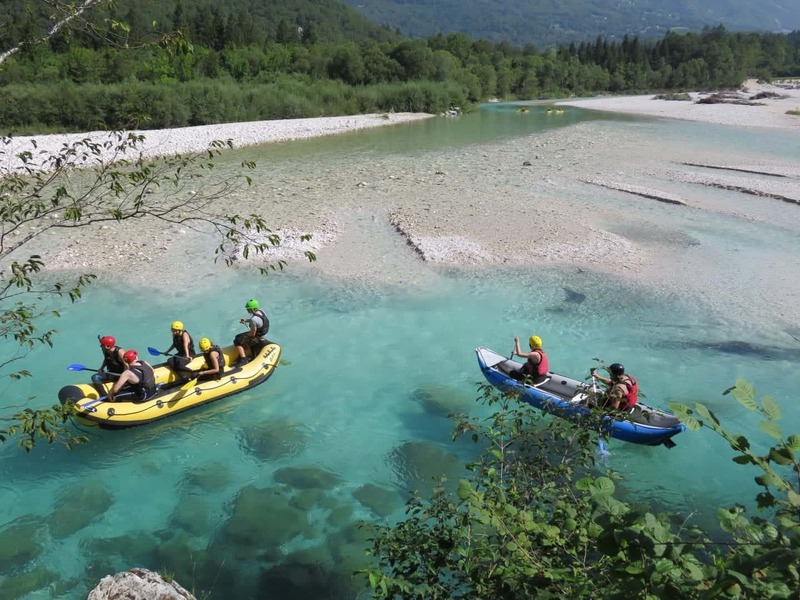 If you love adventure, then you will love Bovec. 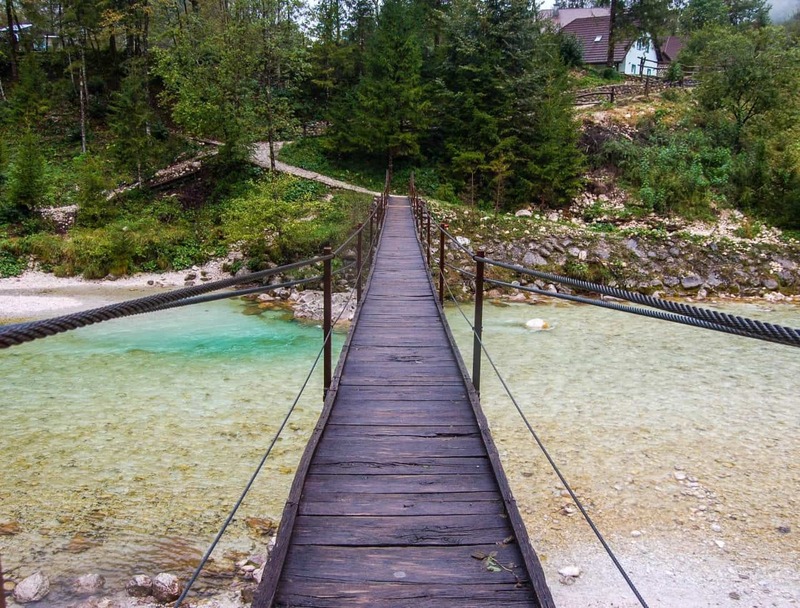 This beautiful place is located just outside of Triglav National park and famous for its skiing, mountain biking, kayaking, white-water rafting, zip lining, hiking, paragliding, caving and the red bull 400 – a vertical run (yes, vertical!). I highly recommend hiring a bike for the day and doing one of the trails that go around the town itself. You can visit some great waterfalls, little villages and idyllic spots. You can choose how hard of a bike ride you would like to do. I got lost many times during the trail so make sure you keep a map handy and have the GPS turned on, on your phone! Where to stay in Bovec: If you’re a backpacker try Hostel Soca Rocks. If you’re looking for beautiful private accommodation, then I recommend Dobra Vila, a beautiful villa close to the centre! 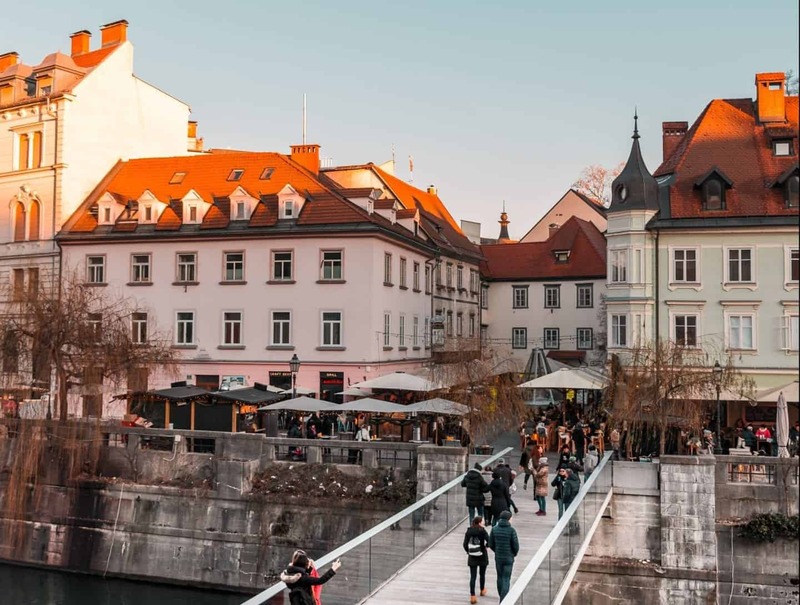 Dubbed as the greenest city in Europe, Ljubljana is a peaceful city with a chilled vibe. A great way to explore the city is by bike or by paddleboard! There are a number of tours that you can do in this city, check them out here(Viator). I highly recommend taking a look at the weekend market. Here you can find a lot of delicious local produce. Also, indulge in great food within Ljubljana. There are so many great restaurants in the city. One that I recommend is Druga Violina which has incredible local food. It’s also run by a local project who help locals with disabilities, who are waiters for the restaurant and also help on the farm where much of the produce is grown. It’s not only a great restaurant but it also helps those who otherwise wouldn’t be able to find work, so your money goes to a great cause! Whilst staying in the city, a must-do is to take the cable car up to the castle for an excellent view of the city. If you want another epic sunset spot, then make sure to visit Nebotičnik café which has one of the best views in the city. Enjoy a glass of wine and enjoy the city from above. Where to stay in Ljubljana: If you’re a backpacker try Hostel Vrba. If you’re looking for beautiful private accommodation, then I recommend Rohrmann apartments. Tucked up alongside Slovenia’s Alps, Kobarid is a tiny town designed for adventure travelers and nature-lovers. Spend your days hiking through old war fortifications in the nearby hills, visiting hidden waterfalls, and crossing hanging bridges over rough-cut gorges full of turquoise water. If you’re feeling really adventurous, white water rafting, canyoning, and paragliding are all popular pastimes here. Back in town, $1 glasses of sparkling wine and $3 burgers await in a relaxed, rural village setting. And foodies will be excited to learn that the world’s top female chef— Ana Roš—runs her restaurant (Hiša Franko) just a few miles outside town. She’s known for creative, elevated uses of local ingredients and traditions. Don’t skip the Slovenian wines hand-picked by her sommelier husband. Slovenia’s wine-making is little-known but incredible. 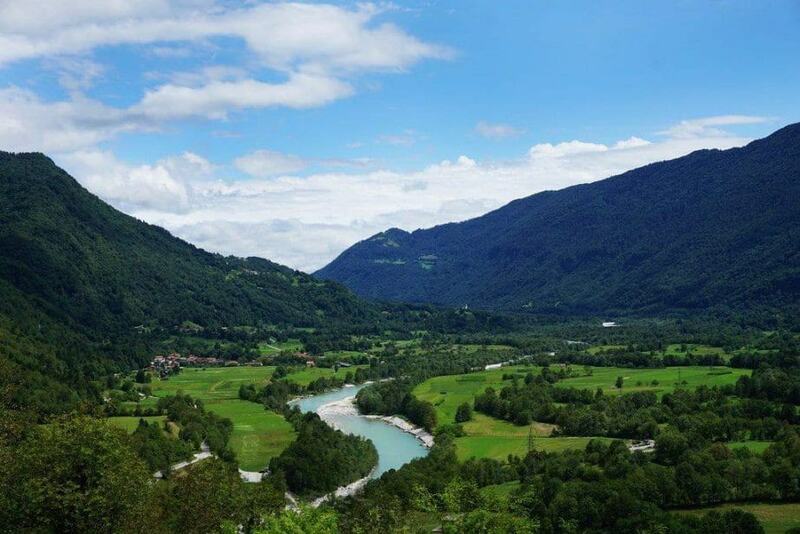 Where to stay in Kobarid: If you’re looking for beautiful private accommodation, then I recommend Apartments Soča Kobarid. When you think Bosnia and Herzegovina you probably think of the Bosnian War in the ’90s which absolutely devastated the country. Still to this day Bosnia and Herzegovina are still recovering from the horrific crimes against this small nation. But the past shouldn’t put you off from visiting this beautiful country. It is one of my favourite countries within the Balkans and one that I deeply connected with during my travels. The landscapes are incredible and it’s extremely affordable making it a backpacker’s dream. Transportation: The most popular and easiest way to travel through the country is by bus. Buses are extremely affordable, within the country and internationally. Can you drink the tap water in Bosnia and Herzegovina? Yes! Accommodation in Bosnia and Herzegovina: There is a range of great hostels and hotels throughout the country depending on your budget. Another great option is Airbnb (Get your free $35 credit here). BiH has been part of many empires and has been ruled by many different peoples. That’s why today is a place where cultures, ethnicities and religions coexist. The best way to experience this is by visiting its capital, Sarajevo. Walk around Baščaršija, and you’ll feel like you’re in Istanbul’s Sultanahmet, turn to Marijin Dvor and you’ll be transported to Vienna. Continue to Ciglane and you’ll find yourself in the middle of communist Yugoslavia. 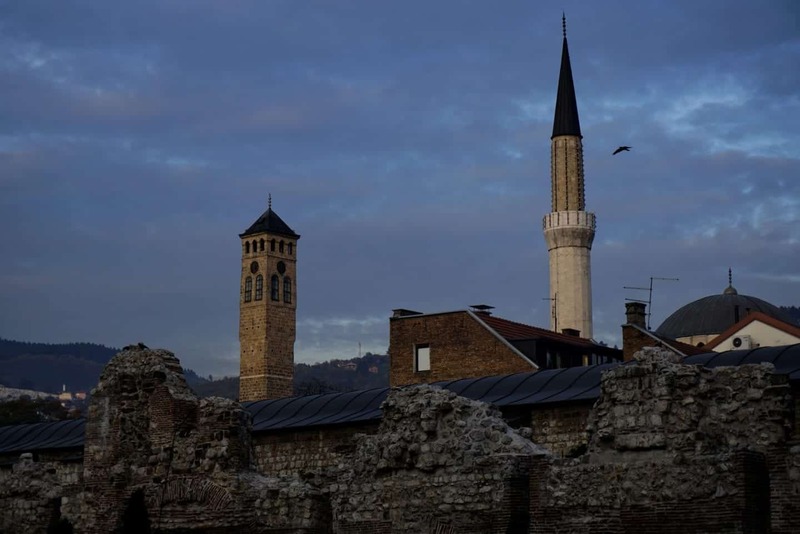 Truly, Sarajevo is where the East meets the West, at the heart of Europe. Pass through the Latin Bridge to see the place where World War II started, and visit Galerija 11/07/95 to learn about the horrors of the latest war. If you want to see more about it, head to the mountains that oversee the city, to the abandoned venues of the Winter Olympics, which Sarajevo hosted in 1984. The tracks were used in the 90’s as a frontline of the war, facilitating the 4 year siege the city was under. Today Sarajevo is a vibrant, cool city, that managed to transform something somber into beauty. Beyond the history and the architecture, what really should convince you to visit BiH is its people. Learn a couple of words of the local language and you’ll make a ton of new friends. Don’t be surprised if you’re invited to someone’s house for a coffee, it’s normal Bosnian hospitality! Where to stay in Sarajevo: If you’re a backpacker try Hostel Check Inn. If you’re looking for private accommodation, then check out Swissotel, a beautiful contemporary and modern hotel in the city. The city of Visoko is located in a hilly area about 30 km north west of Sarajevo. Easily accessible, frequent public transportation makes Visoko a convenient day trip or weekend getaway in nature from the more crowded and bustling Sarajevo. 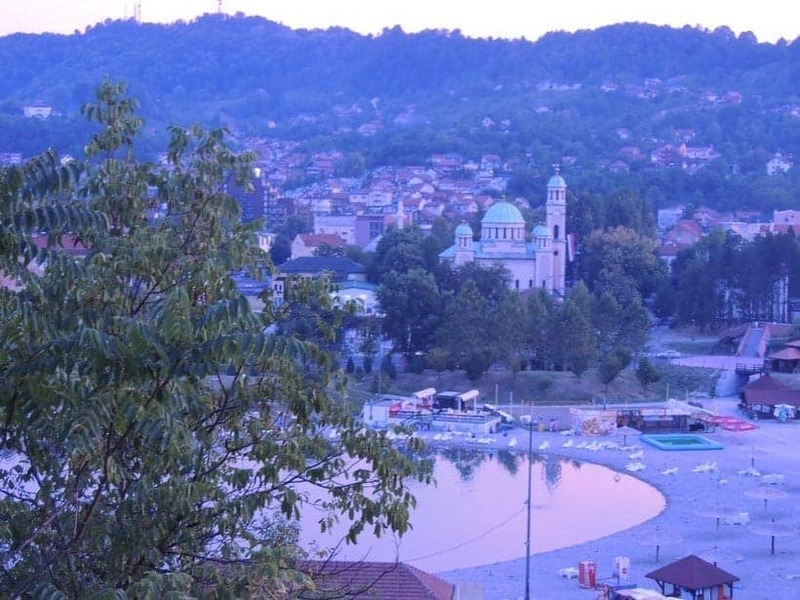 The town rises up on Visocika Hill, at the confluence of the rivers Bosna and Fojnicka. 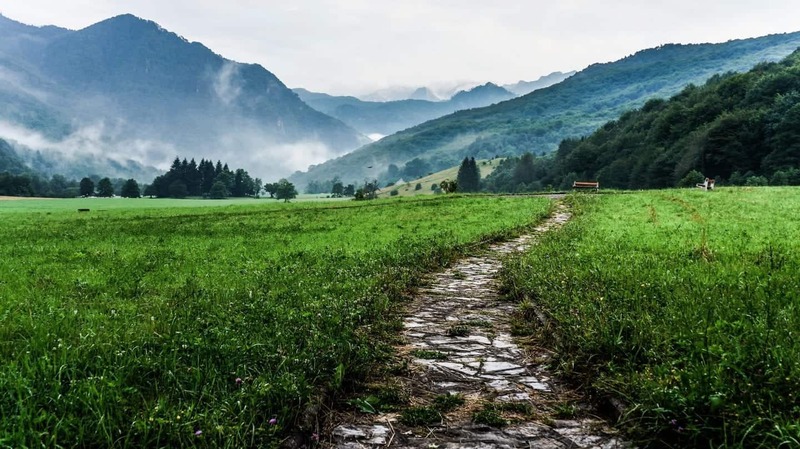 Besides local food, which according to restaurateurs is always high-quality and naturally grown on-site, hiking is the main attraction for the traveller to Visoko. From the bus station, it takes about two hours to hike the main hill up to the remains of the fortress where the queen and King of Bosnia resided during the Middle Ages. The view from the top of the hill is rewarding, and a small wooden coffee house creates the occasion to sit and relax among the green, lush landscape and the blue sky. In the last 10 years, recent archaeological excavation in Visoko has been at the centre of academic and less formal debates. You can read more about that here. The newly discovered underground “Ravne Tunnels” continue to attract the curiosity of local and foreign visitors. To reach the tunnels, keep walking on the road that takes you to the top of Visocika Hill for about 45 minutes. During the Middle Ages Visoko was the centre of the Banate of Bosnia and the Kingdom of Bosnia. Old records show that not far from Visoko centre, in Moštre, one of the first universities in Europe was founded. The Franciscan church in Mile, under Visoko jurisdiction, witnessed the crownings and burials of kings and bans of medieval Bosnia. Where to stay in Visoko: If you’re looking for private accommodation, then check out Holiday Home Nature Neno or Apartment Paradise Visoko. 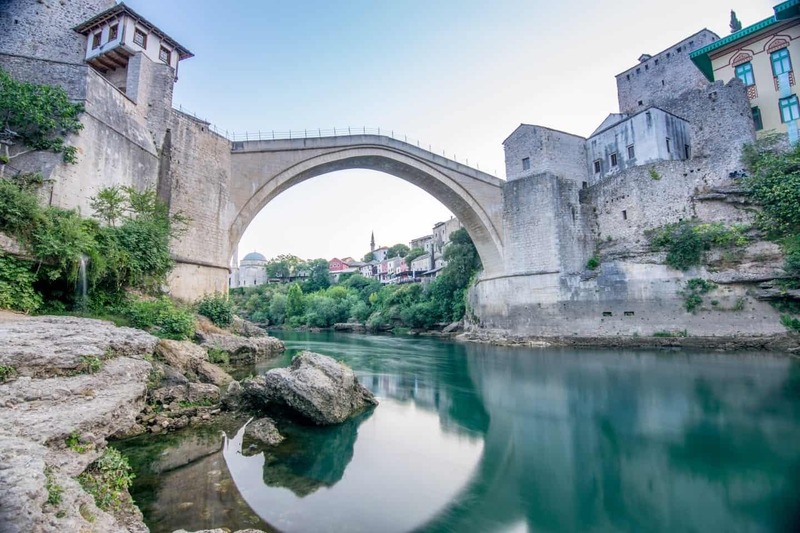 Mostar is one of the most popular places to visit within Bosnia and Herzegovina. It’s famous for having the Red Bull cliff diving competition from the most prominent bridge in Mostar. This is such a beautiful place to chill though. You could easily stay a few days and enjoy this small quaint place with great food, beautiful landscape and interesting history. One of the most popular things to do is to wander through the old town of Mostar. You can enjoy a nice lunch by the river and take in the peaceful setting. If you’re an adventure seeker then go to the abandoned Mostar sniper tower. It’s amongst the tallest building in the town. During the Bosnia war, it was used as a sniper building. You will still find empty bullet shells there today. You get a great view of the city from here too, just be prepared to climb mountains of dodgy stairs! Where to stay in Mostar: If you’re a backpacker try Hostel Balkaneros. If you’re looking for private accommodation, then check out Villa Park, a beautiful accommodation overlooking the Neretva River. Boračko Jezero is a gorgeous little lake not far from Konjic. It’s a little out of the way from the main tourist trail between Sarajevo and Mostar, but totally worth it on your trip to Bosnia and Herzegovina if you want to see a little more than the highlights. The lake is of glacial origin and has very clear water. It’s surrounded by a beautiful forested mountain area, which reflects in it beautifully when the water is undisturbed. The water is at an optimal swimmable temperature in August, but if you find yourself there earlier you can of course take the leap from the jetty or settle for a footbath. There’s a camping area, some holiday rentals, and a few restaurants that might only be open at the peak of summer or sunny weekend days. Activities to do besides swimming are fishing, rowing/kayaking, and hiking in the surrounding mountains. As Bosnia and Herzegovina are still littered with landmines, it’s a best practice to not venture from the trails. You can reach Boračko Lake with your own (rental) vehicle, or by hitchhiking as I did. If you’re feeling adventurous, you can continue on the semi-paved road R453a between Borci and Potoci to end up in Mostar. Tuzla is one of these hidden gem towns in Bosnia. Most visitors arrive in Bosnia via the airport of Tuzla, as it’s well connected to Western Europe via low-cost airlines. However most travellers skip the city of Tuzla and head straight to the main tourist places such as Sarajevo or Mostar. Well, what if I tell you that you can easily spend several days in Tuzla, without getting bored? First of all it’s a great place to get a first insight into Bosnian culture, without being necessarily at a tourist place. It’s always good to see the “real life” of a destination instead of seeing only the most touristy places. But the thing that makes Tuzla truly unique are the Salty Lakes. They are the only ones on the European continent and they are famous all over the region for their wellness effects. The swimming pool are is huge and a must do when visiting Tuzla. Besides the Salty Lakes there are loads of very affordable food options, quaint plazas and several war memorials that are worth to be visited. So, there is no excuse to skip Tuzla on your Balkan trip. Where to stay in Tuzla: If you’re a backpacker try Guest House Pasha. If you’re looking for something more luxurious, then check out Hotel Mellian. Located in the southern region of Bosnia and Herzegovina, Počitelj is a small village along Neretva river. Its stunning landscape is a unique combination of nature and history. Počitelj is a perfect day trip for those interested in art, history and culture. 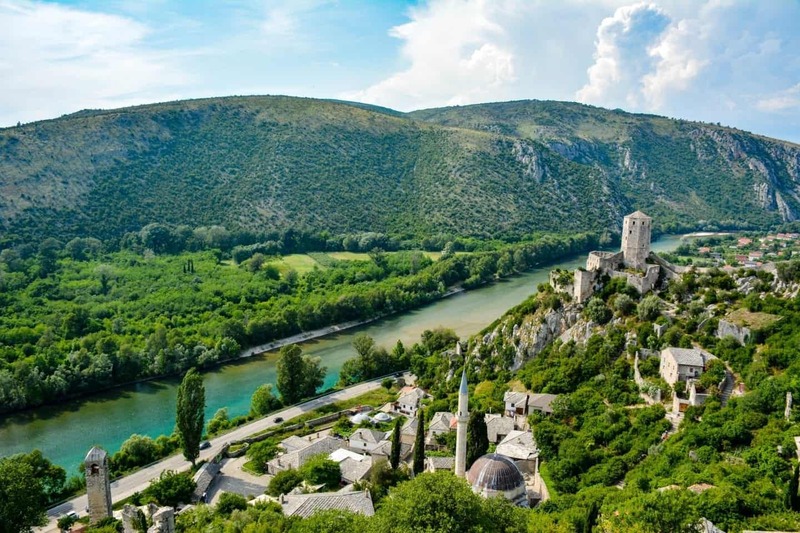 It’s a one of a kind place to visit, just 30 min drive from Mostar. Town’s roots go back to Middle Ages: one of the most prominent places in Počitelj, its citadel, was built in 1383 together with city walls. Town was heavily influenced and changed during the Ottoman rule, where many new buildings, including the mosque, were introduced. Unfortunately, during Austro-Hungarian rule Počitelj lost its importance and suffered extensive damage during upcoming years. But even today this is a magnificent place to be in. While in Počitelj, walk along the city wall and stop at Kula and Sahat Kula – these two towers make up great view points overlooking the town. Visit the castle, wander around charming streets of the old town and enjoy a lovely local market. And don’t forget to try pomegranate juice, an iconic drink of this region. Where to stay in Pocitelj: If you’re looking for private accommodation, then check out Riverside Guesthouse or Rooms Pocitelj. Balkans travel wouldn’t be complete without Serbia. This interesting country is often missed by travellers but there are so many quaint towns, beautiful monasteries and the food, oh the glorious food! Although if you are a vegetarian you may struggle here as Serbia is all about its meat. Serbia was the political epicentre of former Yugoslavia, in fact, Belgrade was the capital of Yugoslavia! It’s one of the largest countries within the Balkans and is the only language in Europe that used both Latin and Cyrillic alphabets. Belgrade is an upcoming city with an array of cuisines and great nightlife. If you travel outside the city you can explore the incredible nature and architecture that Serbia has to offer. Transportation: The most popular and easiest way to travel through the country is by bus or by train. Can you drink the tap water in Serbia? Yes! Accommodation in Serbia: There is a range of great hostels and hotels throughout the country depending on your budget. Another great option is Airbnb (Get your free $35 credit here). Belgrade is a seriously hip city, with unique nightlife and great opportunities to explore culture and history. The capital of the former Yugoslavia, the city is beautiful and well-maintained. I personally love the architecture, where you can see the colorful houses of Zen juxtaposed against the brutalism of Novi Beograd. 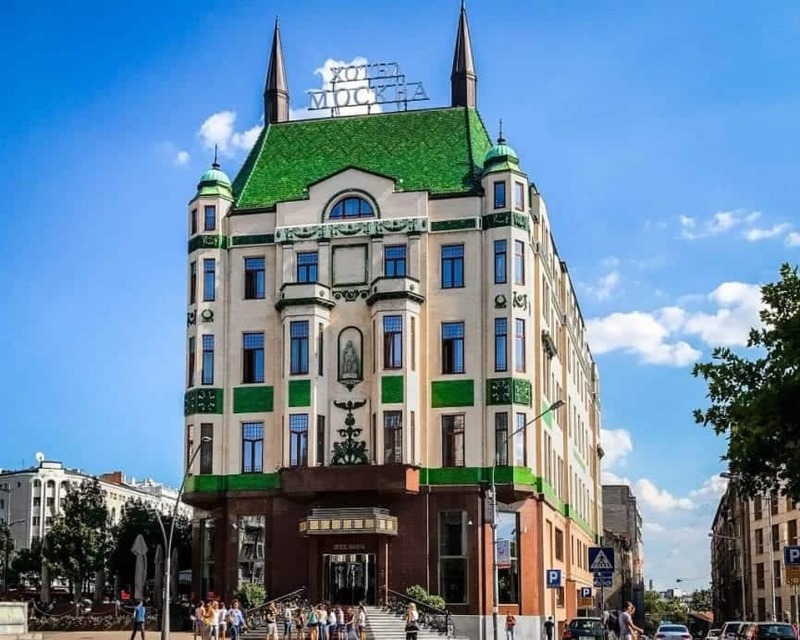 Another can’t-miss building in the city is the gorgeous and green-roofed Hotel Moskva, one of our favorite Belgrade hotels. Don’t just stop by to admire the building though. While here, make sure to go inside and try a piece of their famous namesake Moskva Schnitt cake. Other Belgrade highlights include exploring the city’s many promenades and river walks. Because Belgrade sits at the confluence of the Danube and Sava rivers, there are miles or waterfront restaurants and parks to explore. The easiest way to get to the city from abroad would be to fly into Belgrade’s Nikola Tesla Airport, though anyone traveling from a neighboring country will find that buses or train travel are far more economical ways to travel. Where to stay in Belgrade: If you’re a backpacker try Hostel Jasmin. If you’re looking for private accommodation, then check out Hotel Bohemian Garni, a beautiful contemporary and modern hotel in the city. Nis is the third largest city in Serbia and one of the oldest in Europe. During WW2 much of the population of Nis was killed by the Germans or sent to the nearby Crveni Krst concentration camp. This city was also occupied by the Romans who left the Roman ruins of the fortress and the Ottomans, who created skull tower (a literal tower made of real skulls). As you can tell there’s an abundance of interesting history in Nis! Where to stay in Nis: If you’re a backpacker try Bloom Inn. If you’re looking for private accommodation, then check out Garni Hotel Eter, a beautiful hotel in the city. North of Belgrade, Serbia’s second-largest city, Novi Sad has a completely different vibe to its capital. Situated on the River Danube, Novi Sad is an attractive town worthy of spending a day or two, It is also a great place to break the journey between Budapest and Belgrade. Many travellers associate Novi Sad with the annual EXIT music festival but outside of that one exuberant weekend in July, the city offers a much more tranquil experience with large squares, wide boulevards, and early 19th-century architecture dating to the time when this region was part of the Austria-Hungary Empire. Sightseeing highlights include the 17th-century Petrovaradin Fortress, Stari Grad (the old town), City Hall, the Bishop’s Palace, and the colourful Neo-Gothic Church of “The Name of Mary”. Talking about colour, Novi Sad is one of the most colourful cities in the Balkans and one of the best things to do is wander the streets and discover the vibrant and ornate architecture. 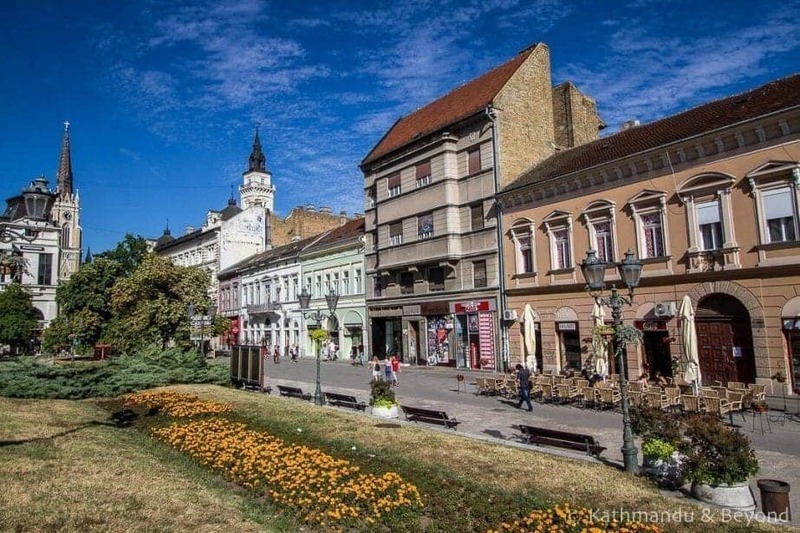 Novi Sad is also a great place to base yourself for excursions to the surrounding area – Orthodox monasteries, wineries and Fruška Gora National Park, for example. There are currently major engineering works taking place on the train line, so until these are complete the best way to get from Belgrade to Novi Sad is either by private car or public bus, a journey of around one and a half hours. 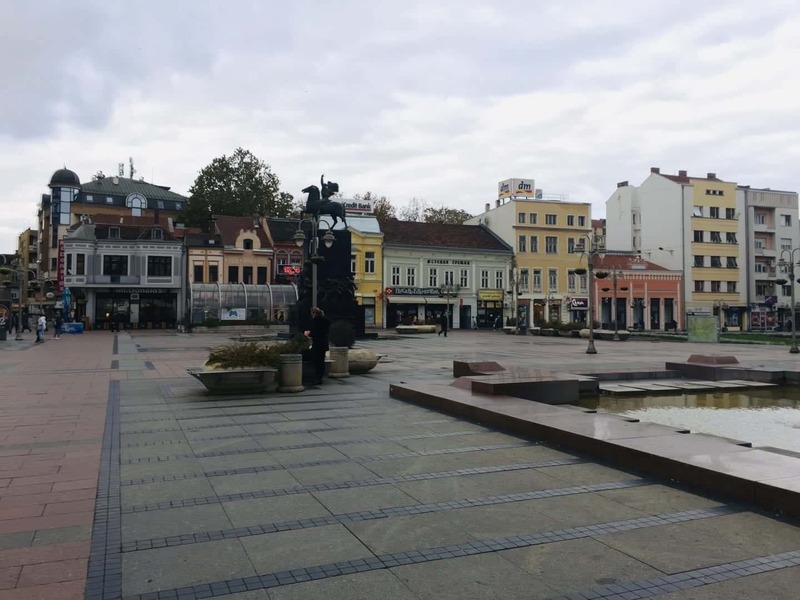 And while it’s possible to visit Novi Sad as a day trip from Belgrade, staying there will allow you to enjoy the city at a more leisurely pace. Where to stay in Novi Sad: If you’re a backpacker try City Hostel. If you’re looking for private accommodation, then check out Apartment Eugen, a modern apartment located in the city! Located just a short drive from Nis, Sokobanja is one of the most well known of the “spa towns” in Serbia. One of the best aspects of Sokobanja is that it feels as a place that Serbians themselves go to relax and to enjoy the hot waters of the thermal springs. These towns and many of these baths do exist in many places, and while Sokobanja may be very popular it still seems to be very local and very Serbian. There are a few baths in the town and several hotels that tout its healing properties. For those visiting, the old Ottoman baths in the center of town makes both a great historical visit as well as a relaxing bit of respite from the wearies of travel. For something that feels more local in appearance, you can visit the Wellness Centar, Sokotherme which has several baths at several different temperatures. You can even pay extra for various extra treatments such as massages. Travel to Sokobanja is not the easiest to get to via public transportation (there is a bus however). Sokobanja is about 1 hr by car from Nis and a very scenic ride through the Serbian countryside. Where to stay in Sokobanja: There’s no hostels in Sokobanja but for budget accommodation you could try Apartment Linera. If you’re looking for private accommodation, then check out B&B Nataly 2. This accommodation comes with breakfast as well as its own spa centre! 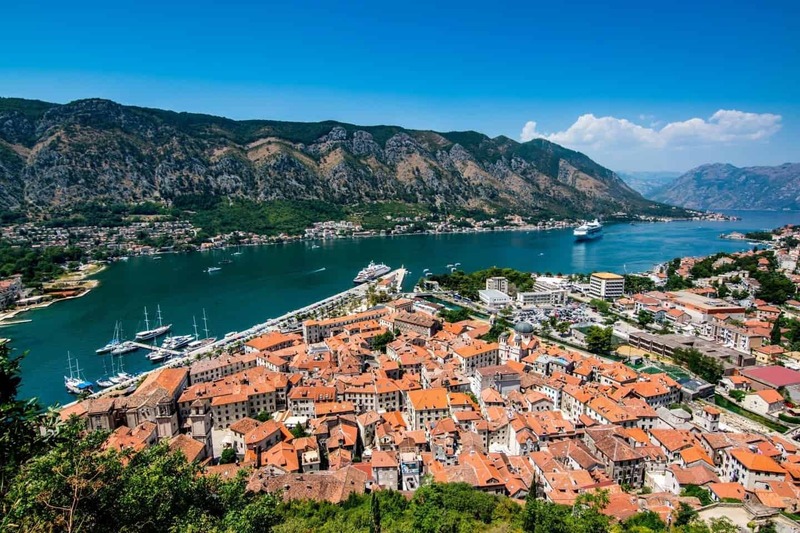 Incredible Montenegro is fast becoming a popular destination within the Balkans due to its incredible scenery, affordability and friendly locals. If you’re looking for a real off the beaten path destination within Europe, then this is it! There are so many great places to visit within Montenegro. If you are a nature lover or an adventure seeker then you will especially love it here as there are lots of activities to do from hiking to rafting etc. Transportation: The most popular and easiest way to travel through the country is by bus. Can you drink the tap water in Montenegro? It depends on where you are staying. Always check with your accommodation supplier if it’s advised to drink the tap water or not. Accommodation in Montenegro: There is a range of great hostels and hotels throughout the country depending on your budget. Another great option is Airbnb (Get your free $35 credit here). Kotor is the main stopover in Montenegro and rightly so. This place is incredible. The cobbled lined streets, peaceful surroundings and breath-taking mountains which overlook the city. This little town will be sure to take a piece of your heart. One of the best things to do, apart from wandering around the old town and soaking up the culture and old architecture, is to walk up to St Johns fortress which sits above the city. It takes about 45 minute to 1 hour to reach the top depending on how many photos you take along the way! I highly recommend taking the steps up and then going the local zig zag path route back down. It’s a beautiful walk and takes you through a couple of drink stalls made by the locals. 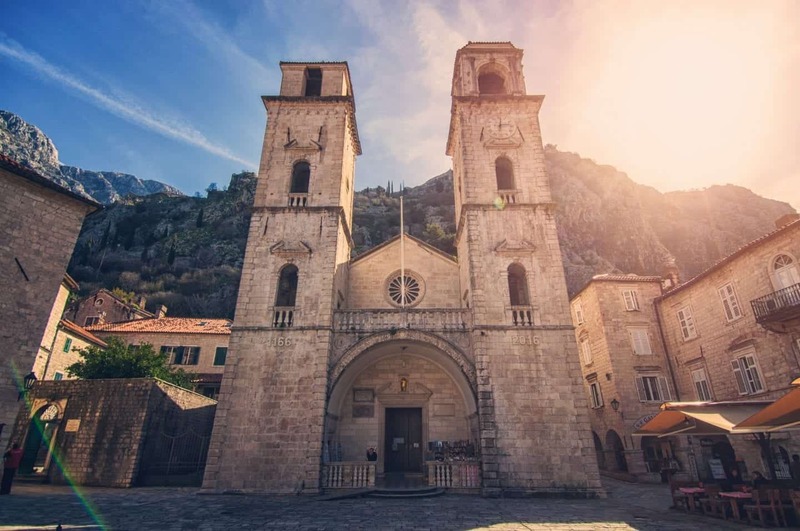 Where to stay in Kotor: If you’re a backpacker you HAVE to stay at Old Town Hostel, it’s one of the best hostels in the Balkans. If you’re looking for private accommodation, then check out Boutique Hotel Astoria, a beautiful boutique hotel set right in the heart of the Old Town. Durmitor National Park in Montenegro is one of the most stunning natural reserves in the Balkans. With a mix of canyons, plateaux, and mountains, the park goes from a Mediterranean to an alpine climate in just kilometres. 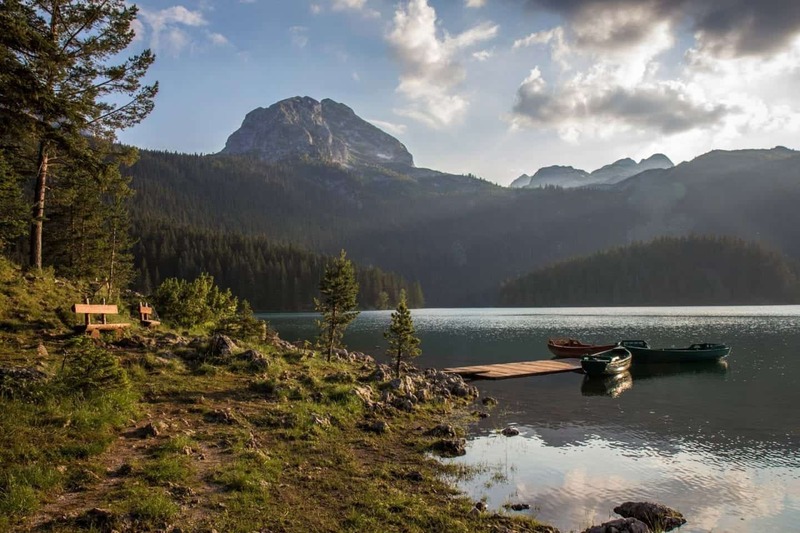 The base for exploring Durmitor National Park is the town of Zabljak. It feels like an alpine resort and is used mainly in winter or skiing in the mountains. But I think it’s even better to stay there in summer and go hiking, climbing, or wildlife spotting. One of the most scenic spots in the park is Crno Lake (Black Lake, in English), which is surrounded by pine forest and dramatic mountains. It’s a good spot for some canoeing or a swim on a hot day. But the centrepiece of Durmitor National Park is undoubtedly Tara Canyon. It is the deepest canyon in Europe, with a maximum depth of 1.3 kilometres and is about 82 kilometres long. It’s a popular spot for white-water rafting and that’s certainly one of the most exciting things you can do here. The best way to get to Zabljak is by bus from cities like Budva or Podgorica. Where to stay in Durmitor National Park: If you’re looking for private accommodation, then check out Hotel Ravnjak. This hotel is in a beautiful setting in the middle of nature. A great place to relax and explore the national park. 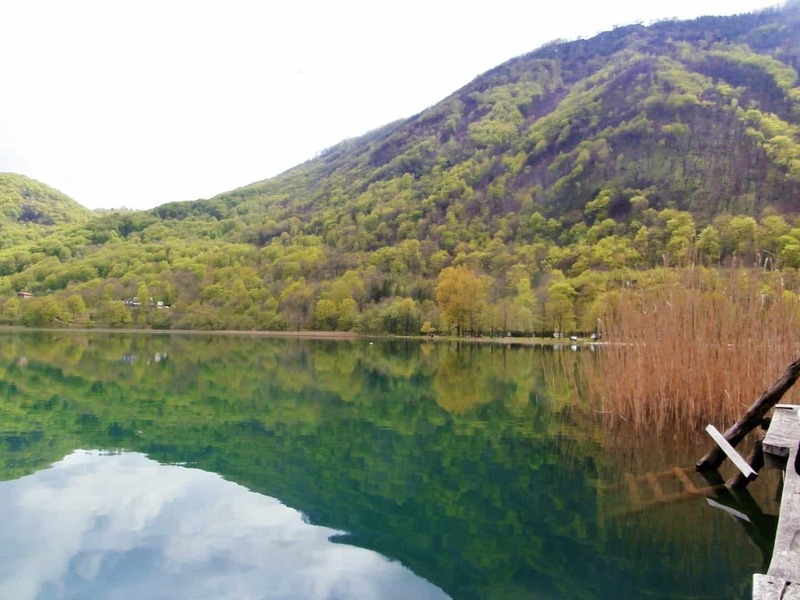 One of the most beautiful parts of Montenegro is the lake it shares with Albania: Skadar Lake. You can do a roadtrip around it and enjoy the views, but you can also experience the lake a bit better if you decide to take a boat trip. In the town called Virpazar you will find many companies which can give you a private or group tour. We shared our reed boat with four other people, which gave us a wonderful experience. Our driver did not speak English, but he managed to explain a lot with the few words he did know and hand gestures. We saw wonderful nature, relaxed on the boat and our captain helped us with wonderful photos. And to make the experience a bit more special, we also got to see the Dalmatian pelicans, which live on the lake. I enjoyed this wonderful lake a lot and recommend it to everyone who visit Montenegro. Stay in Virpazar for a while after your boat trip to enjoy some fish in one of the restaurants to end the day in the best way. Prokletije National Park is one of the most incredible hiking destinations in the Balkans. The park encompasses the Prokletije Mountains (aka Accursed Mountains) of Montenegro, a mountain range that forms the southernmost part of the Dinaric Alps. 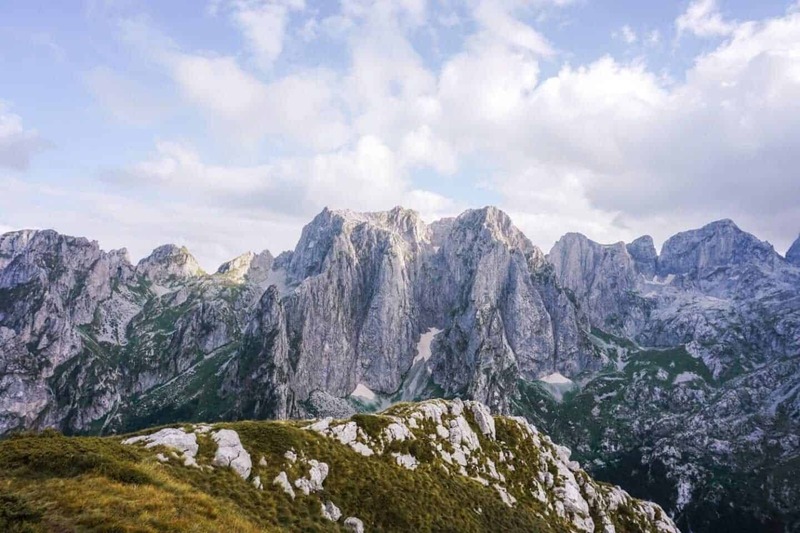 These mountains also extend into Albania, which is why they’re often referred to as the Albanian Alps. Prokleitje National Park is best experienced from Grebaje Valley (also spelled Grbaja), which is a 20-minute drive from the town of Gusinje. The best way to reach Grebaje is with your own vehicle, as public transit is very minimal. From the valley, there are a number of trails you can embark on. Use this Prokletije National Park guide to find out where to hike and where to stay. Ambitious trekkers should consider the multi-day Peaks of the Balkans route that traverses a sizeable portion of the park. 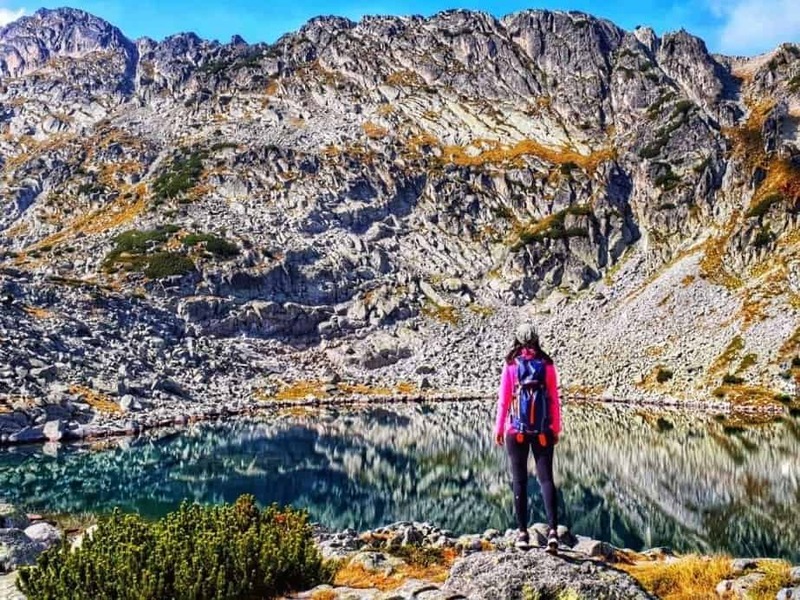 If hiking 192 kilometers across Albania, Kosovo and Montenegro sounds like a lot of fun, begin your planning process early. You’ll have to secure border-crossing permits before you embark on this adventure. Where to stay in Prokletije National Park: If you’re looking for private accommodation, then check out Guest House Merak or Bungalows Katun Maja Karanfil. My Albania! My favourite place within the Balkans and where I currently live! Albania is an incredibly special country and one that people often misunderstand. Albania has a history which is the same (the locals argue older) than the ancient Greeks. If you like history, getting off the beaten path, beautiful beaches and fresh healthy food then Albania is a great pick for you. There’s nothing like Albanian hospitality. The people of Albania are friendly and will feed you until you cannot be fed any more. They are kind, reserved (but also not) and very honest people. Albanians say it like it is, they are very direct. Albanians are good people who have been grossly misrepresented due to Hollywood movies and misconceptions from outsiders who have never stepped foot into the country. Transportation: The most popular and easiest way to travel through the country is by bus or furgon (small bus). If you can rent a car then do it because then you will get to visit some incredible places. Just beware that drivers in Albania can be a little hectic. Can you drink the tap water in Albania? No. Tap water in Albania is not safe enough for human consumption. Accommodation in Albania: There is a range of great hostels and hotels throughout the country depending on your budget. Another great option is Airbnb (Get your free $35 credit here). The bustling capital of Tirana is usually the first stop for many coming to Albania. This artistic and upcoming city is one of my favourites in Europe, not just because it is Albanian but because there are a lot of things to do here. There are great museums (I recommend House of Leaves and Bunk Art 1&2), fantastic restaurants and tonnes of great cafes to soak up the city culture. Make sure you go to Kometiti café which is also a museum that has a variety of different flavoured raki (the local spirit) for you to try. Tirana is extremely cheap as well for travellers coming from abroad. The city has really undergone an incredible transformation over the last few years and I can see it becoming one of the best cities to visit within the Balkans and south-eastern Europe. Where to stay in Tirana: If you’re a backpacker you HAVE to stay at Trip’n Hostel, it’s one of the best hostels in Tirana and you’re bound to have a good time there. If you’re looking for private accommodation, then check out The Plaza Hotel, a beautiful hotel in the centre with a fantastic view and unique architecture. 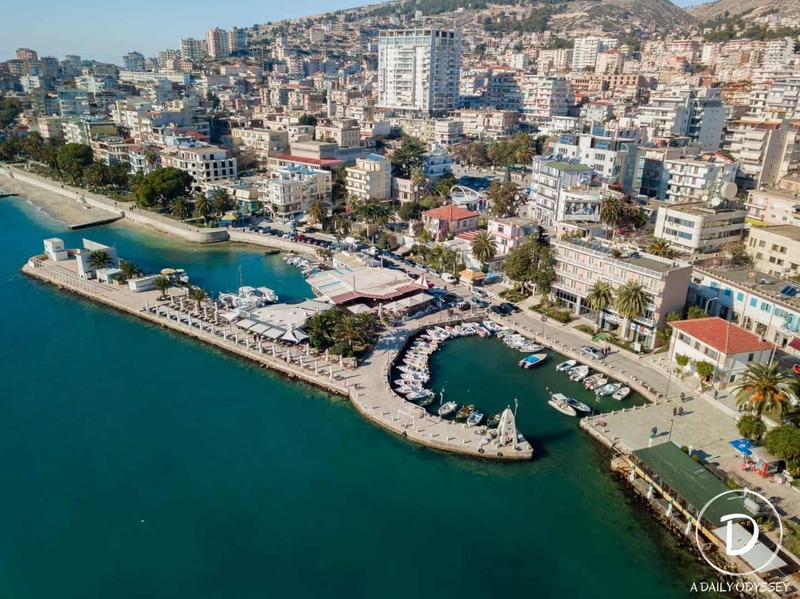 Saranda is where I’m currently based and it’s one city that I highly recommend you visit during your travels to Albania. There is an array of great things to do whether you just want to bum on the beach all day, explore the ancient history or eat your weight in fresh healthy food. Within the city, the Monastery of 40 saints is not to be missed. It’s about a 45-1hour walk up the hill (opposite to Lëkurësi castle) and has a fantastic view of the city. Not many tourists visit this place but it’s one of my favourite places in Saranda (and very peaceful!). Not too far away is also the ancient city of Butrint. You should opt for half a day here to walk around the park and soak up all the history. Another local recommendation (and one that not many tourists know about) it the archaeological site of Finiq (another top place to visit if you’re a history buff. In terms of food, there is fantastic Albanian, Greek and seafood restaurants. I highly recommend Maria Magdalena or Italian Mattarello. If seafood is your thing then make sure you check Anchor Bar (right in the centre) or head to the old port (not the one where the ferries come in). Here is where the fishing boats come and there are two seafood restaurants (I recommend Fishland!). Another favourite of mine for INCREDIBLE Albanian and Greek food is Laberia. This family-run restaurant is where I always take visitors as its great value for money, the family are so friendly and it’s just genuinely great hearty food! Where to stay in Saranda: If you’re a backpacker then check out Hairy Lemon or Hasta La Vista. 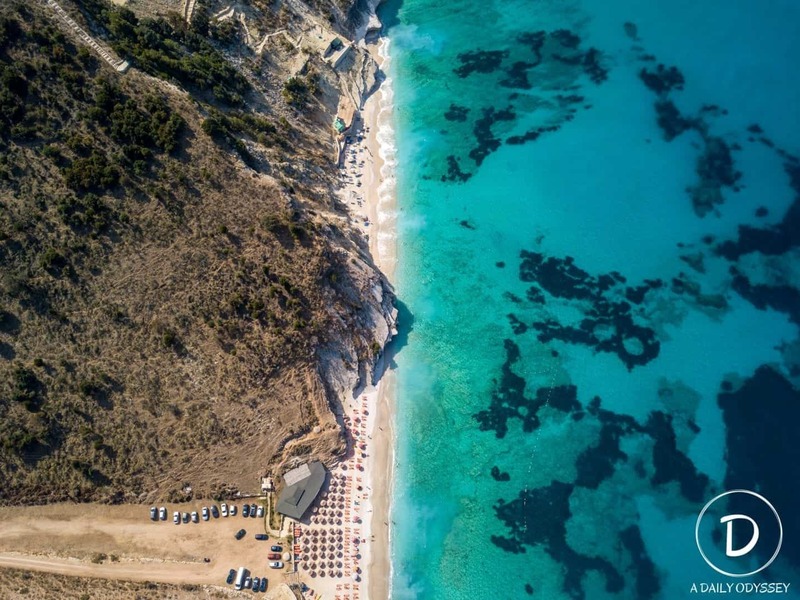 If you’re looking for private accommodation, then check out Santa Quaranta Resort or White Residence Luxury Apartments – They are beautiful with a great seaside view! This beach town is a must-stay during your travels to Albania. I always recommend a trip to Himara for people who are looking for some relaxation. The beaches are beautiful and it’s much quieter than the likes of Saranda and Ksamil. If you go to Himara then make sure you visit the old town which is located on the hill above the seaside part. Here is the old castle intertwined with old stone houses and a real sense of character. You get a beautiful view from there! Where to stay in Himara: If you’re a backpacker then check out Himara Downtown hostel. If you’re looking for private accommodation, then check out Vila Kosteli. It’s a beautiful accommodation option with a great seaside view! The historical city of Kruja is only a stone throw away from the capital of Tirana and a great stopover for a night or two. 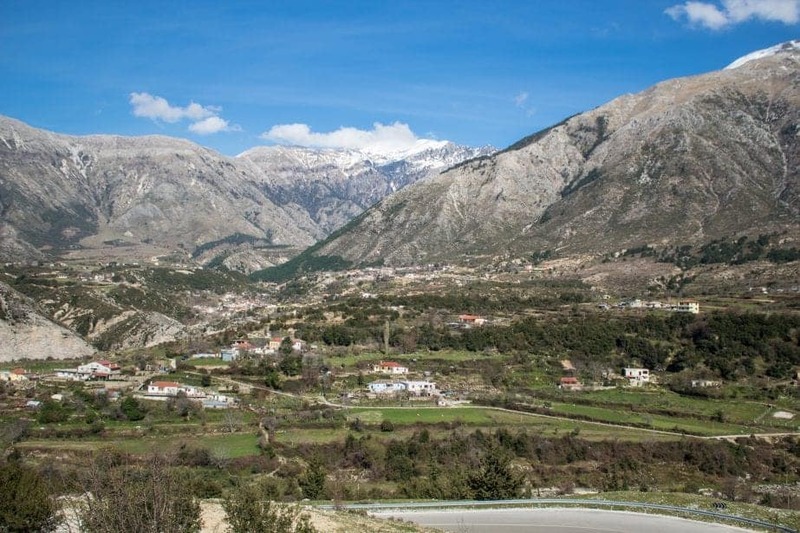 This town is perched on the mountains with the best old markets in Albania. There are fantastic second-hand markets here which are hundreds of years old. The city itself played an important part in Albanian history. It’s often referred to as the city of Skanderbeg as this is where the fight against the Ottomans really started. There is the Skanderbeg museum which is within the castle walls. Where to stay in Kruja: I only recommend one place to stay on your trip to Kruja because it’s simply the best for a local experience at a great price. make sure you stay at Emiliano Rooms. There is a bunch of different accommodation options whether a private room in the 400-year-old historic house or a stay in one of their bungalows with an incredible view! A trip to the northern city of Shkoder is always a great idea. This city is one that is so unique to Albania. In fact, it feels different to any other place within the country. Cobbled streets, French-inspired architecture and so many people biking! The city is also the gateway to some fantastic hikes within the region including the famous Theth- Valbona hike. If you want to do some hiking, chances are you’ll base yourself Shkodër! Where to stay in Skhoder: If you’re a backpacker then check out The Wanderers Hostel. If you’re looking for private accommodation, then check out Hotel Legjenda (it’s a little out of the centre but very beautiful!) or if you want somewhere in the centre of the city then try Rose Garden Hotel. Only a 20-minute drive away from Saranda is what’s called ‘the gem of the Albanian Riveria’. Ksamil is the most popular stop because its beaches are so pristine and beautiful. However, with beauty comes fame, so during June/July/August Ksamil because packed with people. When I say packed, I mean packed. I always recommend people to come here out of season because it’s much more beautiful and peaceful during that time. Although it’s a popular place it’s still incredibly beautiful and not to be missed during your Balkan travels. If you get the chance, make sure you visit nearby beaches of Mirror and monastery beach. 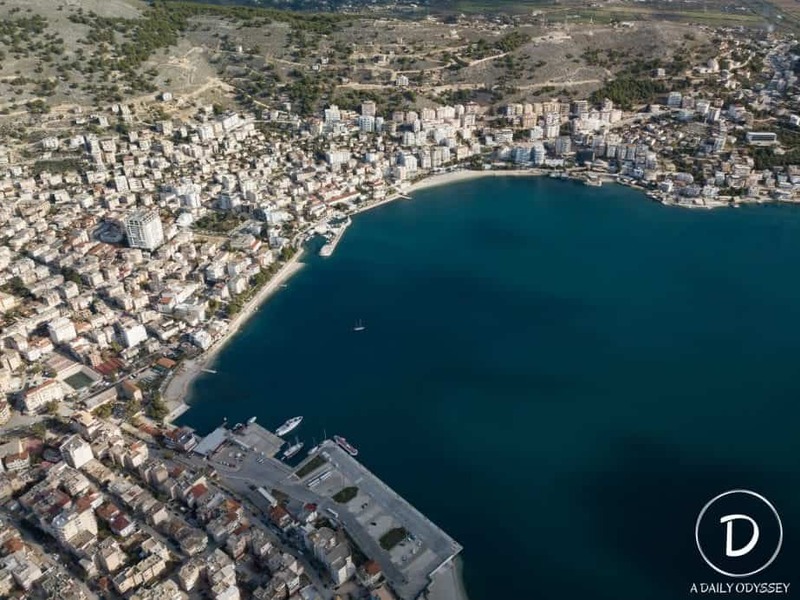 You can easily catch the bus that goes to Saranda to one of these beaches. They are very beautiful too! 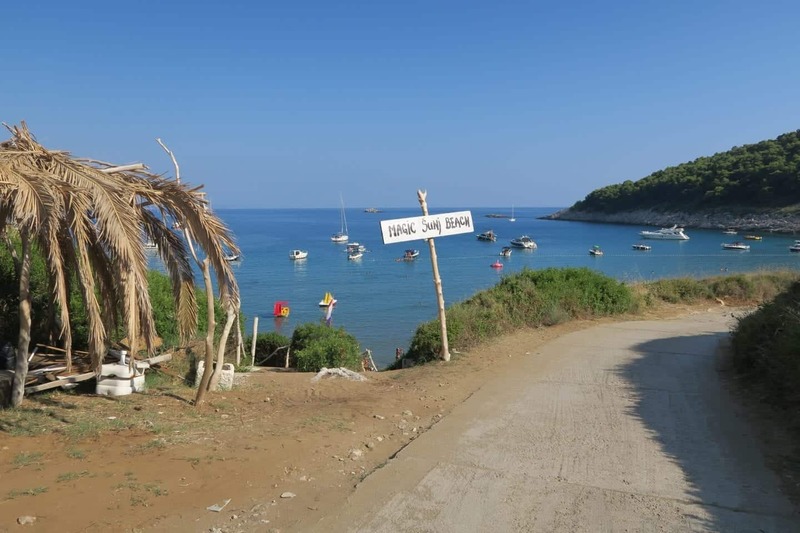 Where to stay in Ksamil: There are no hostels in Ksamil but there are great camping and budget private accommodation options. If you’re looking for private accommodation, then check out Zace Studios or Hotel Mira Mare. 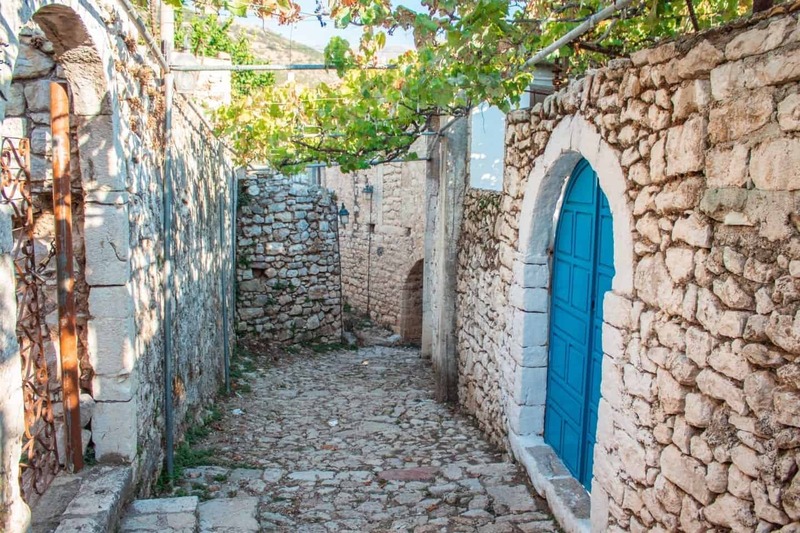 This UNESCO town is a must-see during your travels to Albania. It’s often referred to as the town of one thousand windows, due to the architecture of the Ottoman-styled houses that are prominent in the centre. Make sure you take a visit to the castle as well as wander around the town and enjoy the setting. The town is set right next to a river and surrounded by beautiful scenery. There are also a few great wineries in the area, my favourite is Cabo. You can do a tasting here for an affordable price and get an insight into the Albanian wine production! 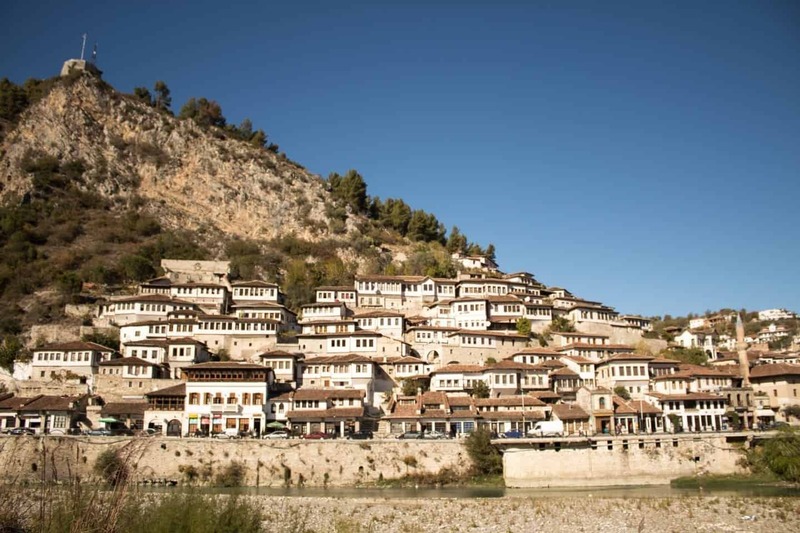 Where to stay in Berat: If you’re a backpacker you have to stay at Berat Backpackers, its set in a UNESCO protected house. They also have private rooms! If you’re looking for private accommodation, then check out Hotel Muzaka, a beautiful hotel set right next to the river with a superb view! Did you know that Kosovo is Europe’s newest country! Only in 2008 did Kosovo declare itself as its own country and not part of Serbia. Unfortunately, many nations still don’t recognize Kosovo as a country including Serbia, China and Russia. Kosovo is one of my favourite countries in the Balkans. 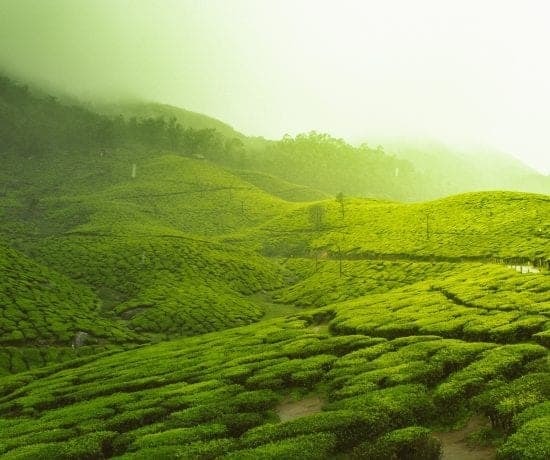 The nature is extremely beautiful, and the people are very friendly and helpful. There are many great places to visit in Kosovo as you can see below. It also has the youngest population in Europe as half of its population is under 25. *Kosovo’s independence is not up for discussion in this post and any hate will be deleted and reported as spam. I recognize Kosovo’s independence. Can you drink the tap water in Kosovo? It depends on which region you are staying in. Always check with your accommodation supplier if it’s advised to drink the tap water or not. Accommodation in Kosovo: There is a range of great hostels and hotels throughout the country depending on your budget. Another great option is Airbnb (Get your free $35 credit here). Gjilan is not a city that is ever recommended to visit when someone is in Kosovo. However, there are a couple of places that one can do if deciding to spend some time there. Gjilan can be easily reached from the bus station in Pristina (buses leave every 20 minutes and the ticket costs 2 EURO one way). There are a few places I’d recommend for anyone looking to have a great time when in Gjilan: Te Papaku and Intro are lovely places to have a coffee during the day or a beer at night time (or any other drink you prefer); Kimi Cafe and Cake House is another lovely place that serves delicious sweets and has three locations with my favorite one being opposite ETC supermarket; Baron, Meridian, and Forum are good places for having an inexpensive, tasty lunch; and the city park is a good place to spend some time and get to see some of the important people of Gjilan and the region. In case one has more time, a good lunch at one of the following restaurants could be a good idea: Planet (on the road to Kamenica), Vali Ranch in Perlepnica village, or Bujana just outside the city on the way to Ferizaj. 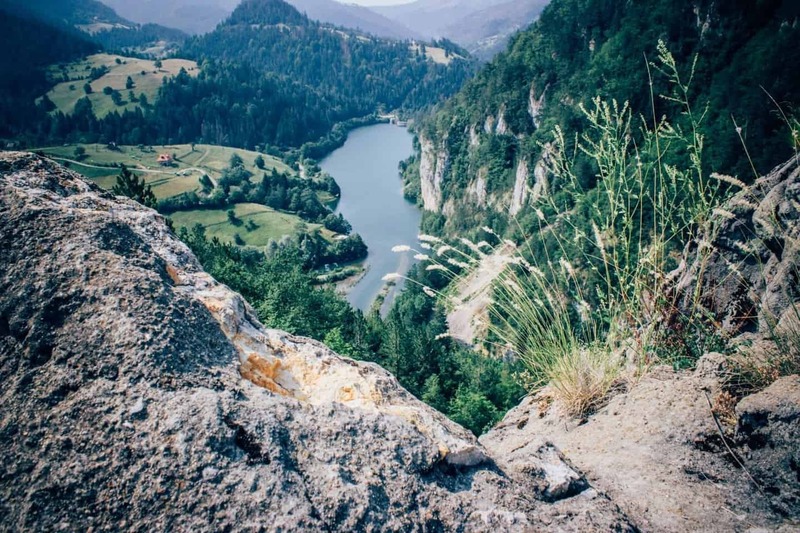 If you feel more adventurous, you can go hiking at the Pogragje castle or go fishing at Livoc Lake. Pristina is an upbeat city with plenty of cafes, things to do and a rich history. One of my favourite things to do is to just simply walk around, from café to restaurant and enjoy city life. Pristina is a very small city but it’s one that has a lot of heart. While you’re in the city make sure you visit the Cathedral of Saint Mother Teresa. You can climb the stairs for 1 euro and get a nice view of the city. Another recommendation is to visit Germia park which is located not far from the centre as is a popular hangout for locals in the summer. 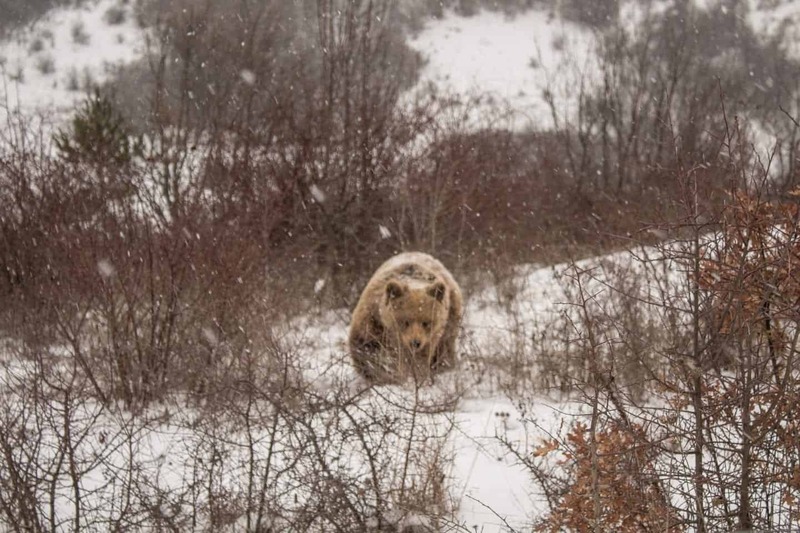 There’s also a bear sanctuary (ethical) nearby which I highly recommend a visit! If you’re a lover of street art then make sure you visit Rruga B (Street b). 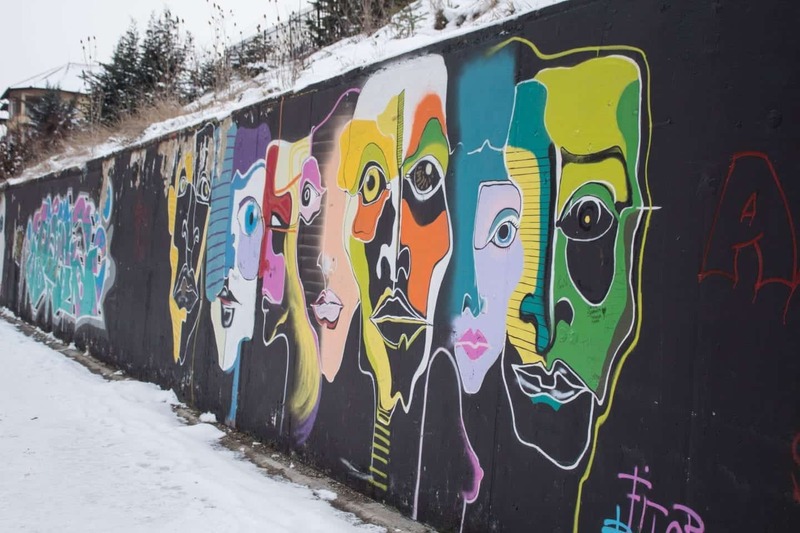 There are over 1000 meters of wall covered in beautiful graffiti done by local artists. The wall is run by a non-profit organisation Q’art which promotes art within the community. Where to stay in Pristina: If you’re a backpacker you MUST stay at Prishtina Centre Hostel, I always stay there when I’m in the city (they also have private rooms). If you’re looking for private accommodation, then check out the Swiss Emerald Hotel, a beautiful luxury hotel set right in the centre. 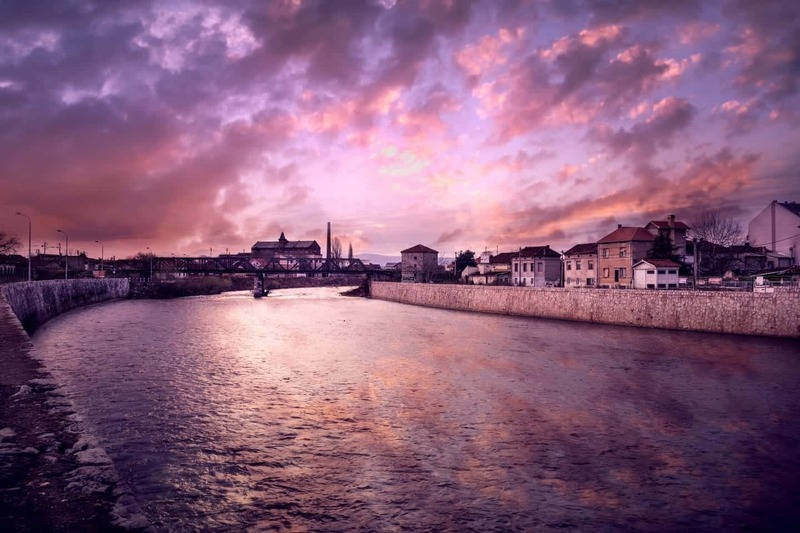 The city itself is only the start of everything you can do in Peja. Peja is the gateway to Kosovo’s mountains and there are several exciting daytrips you can make. 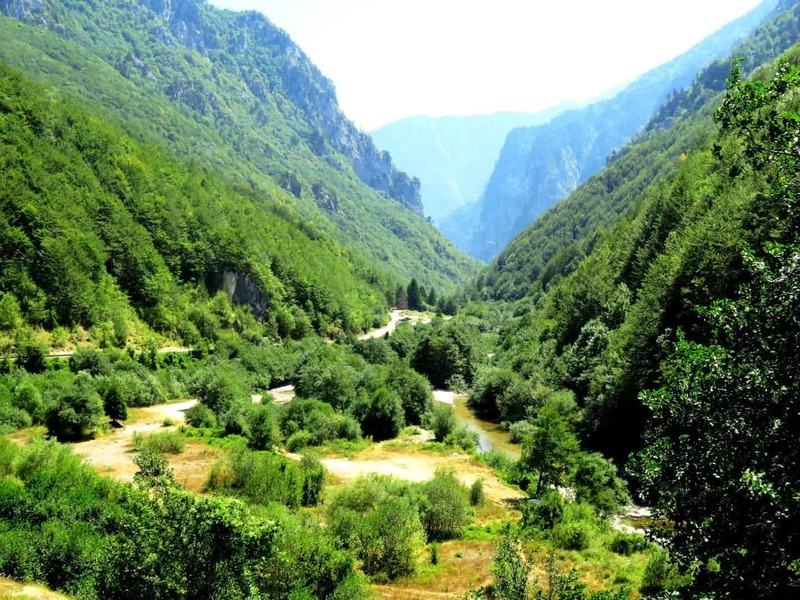 Nearby is the beautiful Rugova canyon that leads to the Rugova valley. At the end of the road you find the small mountain village of Boge from where you can make several hikes into Kosovo’s spectacular nature. Besides the mountains there are two old Serbian monasteries that one can visit easily from Peja. The Patriarchate of Pec and the Decani monastery are both worth a visit. Both have beautiful frescoes on the inside and they have a big historical significance for the Serb Orthodox community. 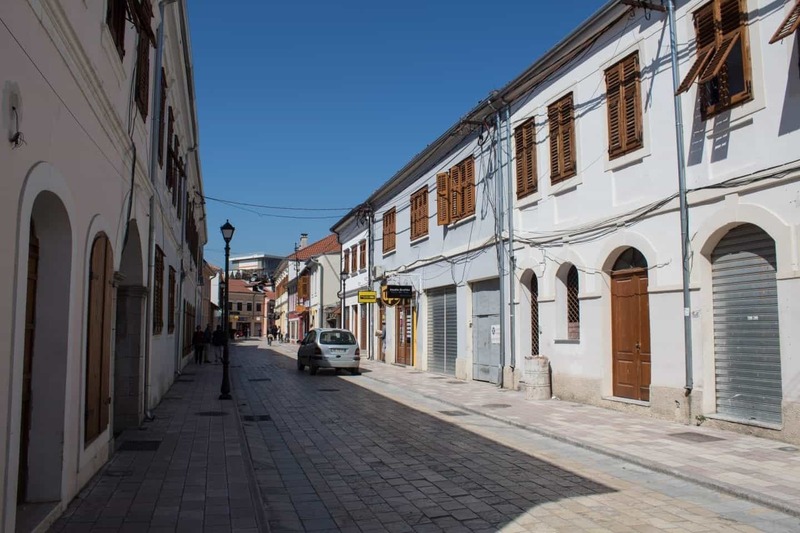 Peja is well connected with other cities in Kosovo like Pristina and Prizren, but also with Montenegro and Albania. It’s so easy to get to Peja that it is a shame if you don’t include this beautiful city in your Balkan itinerary. Where to stay in Peja: If you’re a backpacker you can stay at Hostel Sarac, it’s the only hostel in Peja. If you’re looking for private accommodation, then check out the Chalet Kujta or Guesthouse Stone Bridge. Prizren is a must-see stop if you’re visiting Kosovo. The quaint little town is set beside a river and is one of the most beautiful towns in the Balkans. There are bustling streets to wander and historic mosques to visit but the highlight of the town is the ancient fortress which sits atop a hill overlooking the town. The walk up here is well worth it for the views alone but the fortress offers a great insight into the history of this area. Riverside walks in Prizren are particularly beautiful on a summer evening when the bars and cafes offer outdoor seating and everyone is enjoying the warm weather. You can also time your visit to enjoy DokuFest and international film and arts festival held in Prizren each year. 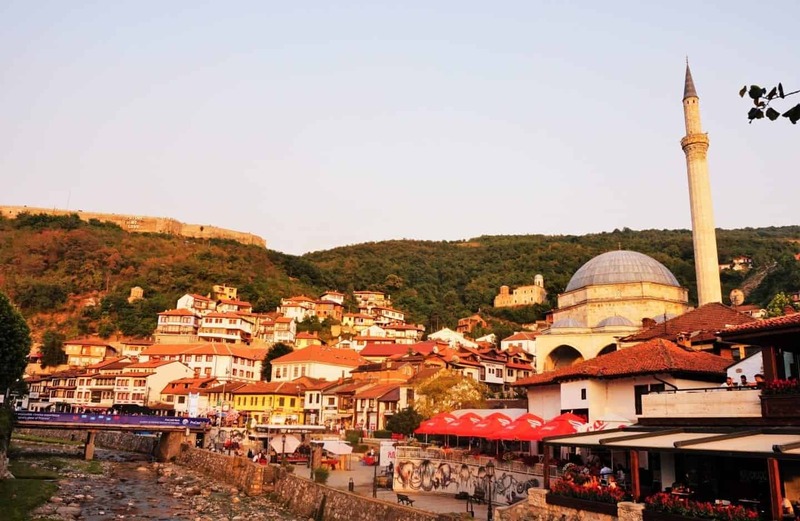 Prizren is an easy one and a half hour drive from Kosovo’s capital Pristina. Where to stay in Prizren: If you’re a backpacker you can stay at Driza’s House set in a 300-year-old family home! If you’re looking for private accommodation, then check out the Hotel Prizreni or Hotel Tiffany. *As of Feb 2019, the name of the country has changed from Macedonia (FYROM) to North Macedonia. This beautiful land-locked Balkan country is so much more than just Ohrid and Skopje, where most tourists head straight to. In fact, North Macedonia is a haven for wine, churches and breath-taking nature. From beautiful villages to a bizarre statue filled capital and nature that can only leave you speechless, let’s discover some of the best places to visit in North Macedonia! Can you drink the tap water in North Macedonia? It depends on which region you are staying in. Always check with your accommodation supplier if it’s advised to drink the tap water or not. Accommodation in North Macedonia: There is a range of great hostels and hotels throughout the country depending on your budget. Another great option is Airbnb (Get your free $35 credit here). 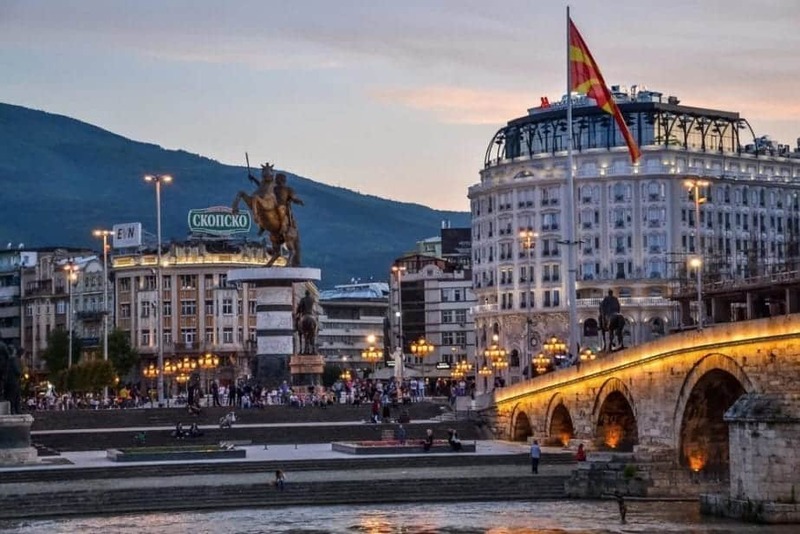 Skopje, the capital of North Macedonia, is often overlooked and underestimated by tourists but there are actually many things to do in Skopje that will keep you busy for a day or two. You will quickly realize that this is one of a kind city: the center is full of weird and quirky statues and newish buildings that resemble ancient ones, the local bazaar is the biggest one in the Balkans (after Istanbul), and the brutalism architecture is a masterpiece here. Skopje is also a perfect base for nature half day trips, the nearby Mount Vodno and Matka Canyon are an ideal getaway from the hustle and bustle of the city. Skopje is also a perfect value for money, accommodation and food is really affordable here. The capital of North Macedonia is very well connected with numerous European countries thanks to low-cost airlines, you can also get here overland from other Balkan countries. Where to stay in Skopje: If you’re a backpacker you can stay at Shanti Hostel! If you’re looking for private accommodation, then check out the Up.Cooltura Guesthouse or Hotel Mirror. 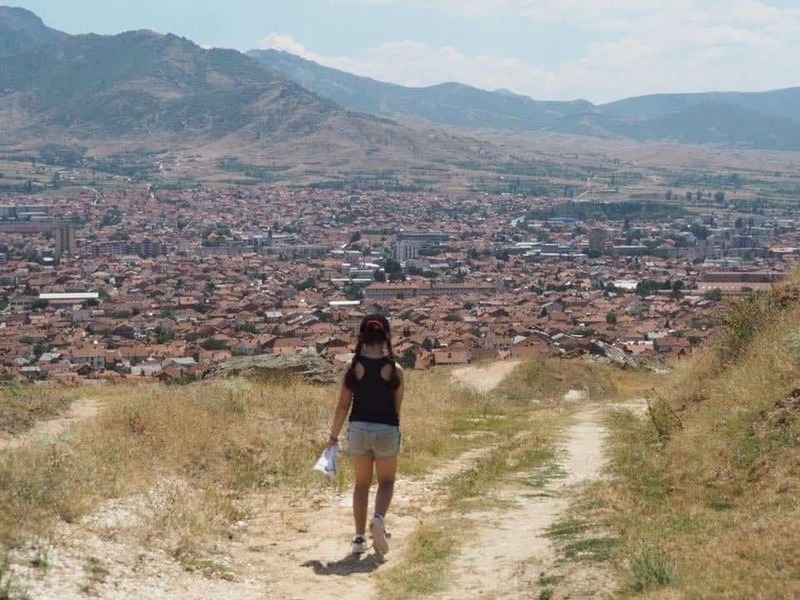 Prilep is North Macedonia’s fourth largest city and is easily accessible by car, bus or train. Sitting in the middle of the Pelagonian plain, this city provides a number of exciting things explore. Arriving by train is perhaps the easiest way to find your way to Prilep from Macedonia’s capital city of Skopje. While you can walk from the station to the town centre, taxis are easily available and quite inexpensive. In fact, taxis are plentiful in Prilep and one of the easiest ways to get around if you want to really explore the sites. Marko’s Towers, known as Markovi Kuli by most Macedonians, rises 180 metres in height and overlooks the town. While little tourism infrastructure has been put in place, visitors can walk right to the top and explore the ruins set amongst the mountain. The way up is a little steep, but the path is clearly visible with red markers denoting the way up. If walking and exploring isn’t your thing, Prilep is also quite famous for its religious sites in the mountains. A trip to the Monastery of Zrze, the Monastery of the Holy Archangel Michael and the Monastery of Treskavec will unveil some fascinating Byzantine frescoes, some dating the early 14 and 15th centuries. You can also marvel at the monk cells carved into the mountains and the various other religious items. 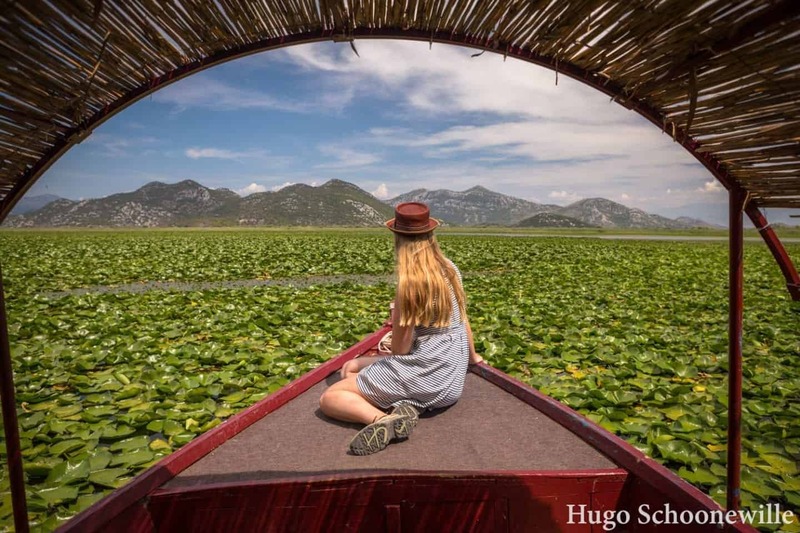 If you are really lucky and make acquaintances with knowing locals, you may also get a chance to visit the marble lake or even discover where the rare Prilep ruby (the only ruby found in Europe) is found. Where to stay in Prilep: There are no hostels in Prilep but there’s great private accommodation including Antika Guest House. Sitting on the Vardar River, Veles itself is unremarkable, it is what lies just outside the city which makes it a place to visit when you are in North Macedonia. Accessible by the local train from Skopje, visitors can book a taxi on arrival to take them to the main attraction: Stobi. Stobi is an incredible ancient city ruin which you can visit and explore, and without the crowds that you are usually faced with in other countries. 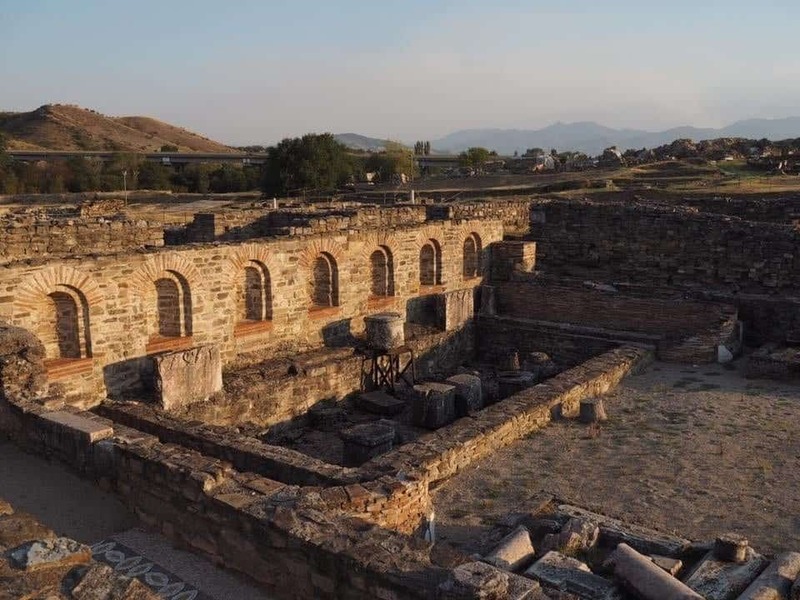 Considered as the most famous archaeological site in Macedonia, Stobi was developed pre-217 BCE and features theatres, living areas, religious sites and even a mint which denotes its importance during Roman times. The Synanogue Basilica is also important, informing historians that there was a strong Jewish population. If you have a chance, make sure you also visit Heraclea Lyncestis in Bitola. If exploring ancient ruins isn’t your thing, the Stobi winery nearby is considered one the best in North Macedonia and a great place to stop or lunch. Where to stay in Veles: There are no hostels in Veles but there’s great private accommodation including Romantique Veles Hotel or Gardenia Hotel & Spa. 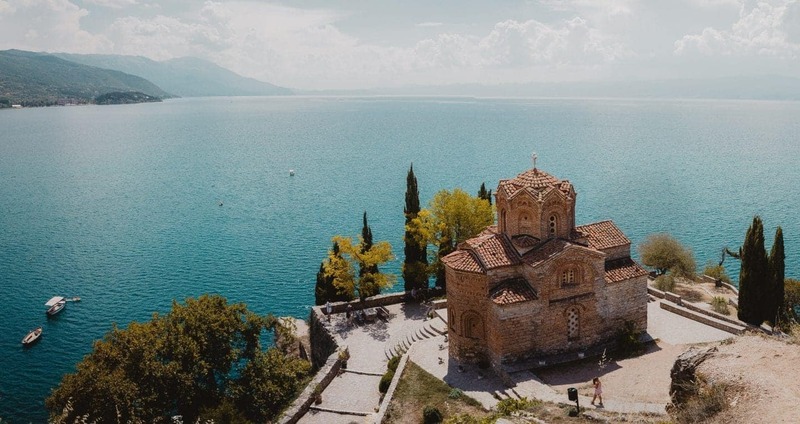 Ohrid is an incredibly popular spot to visit and one of the top places on anyone’s North Macedonian bucket list! That is because it’s simply beautiful! You would have likely seen many photos of the church of St John which sits on the hill overlooking Lake Ohrid. It’s one of the most photographed spots in the Balkans! 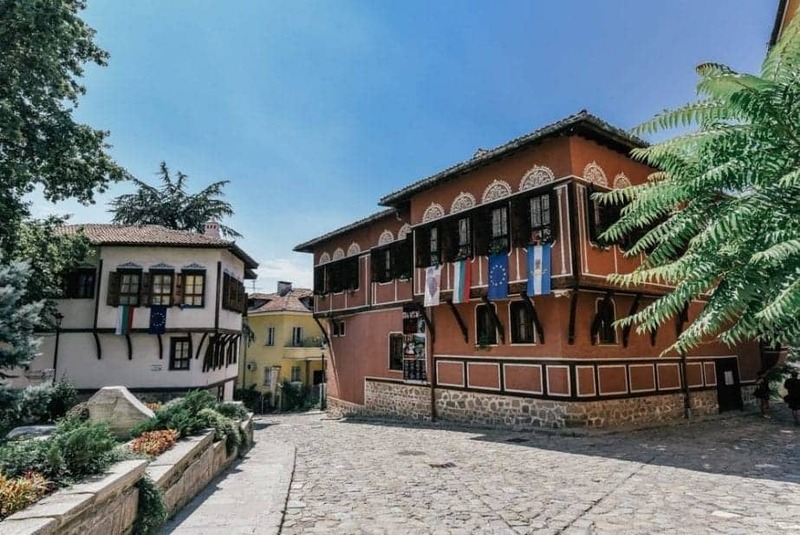 You could easily spend a few days in Ohrid, enjoying the view, wandering the streets of the old town and checking out the medieval churches and ruins. The city is small and is one of the many UNESCO protected places within the Balkans. Where to stay in Ohrid: If you’re a backpacker you can stay at Sunny Lake Hostel. If you’re looking for private accommodation, then check out the Ristos Guest House or Hotel & Spa Tino Sveti Stefan. Kruševo is the highest town in North Macedonia, rising over 1350 metres above sea level. If you are keen to really dig into the culture of the country, this town needs to be on your itinerary. With a history reaching back further than the Byzantine Empire, Kruševo offers a glimpse into the deep history of the country right through to the Ilinden Uprising which led to the creation of the first Republic of the Balkans. A visit is not complete without a stop at both the Mečkin Kamen, a spot which makes the 1903 uprising and the very spot annual North Macedonian Independence Day celebrations start, and the Makedonium monument which is dedicated to the Ilinden Uprising and was constructed in true Brutalistic Architectural fashion – it is so off it features in the Atlas Obscura! On the way to these famous monuments, a stop at the Todor “Toše” Proeski Museum is often added to visitors itinerary. Tose was a famous singer who died in a motor vehicle accident when he was only 26 years old. 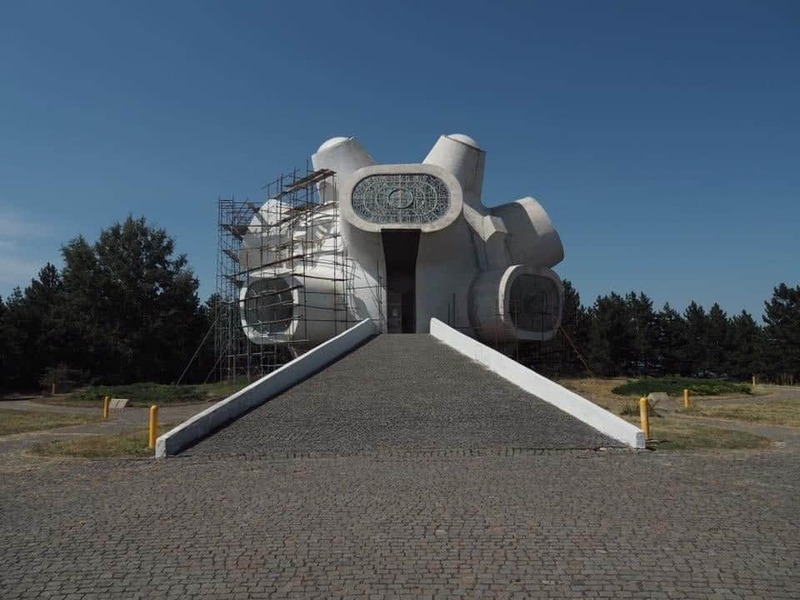 Dubbed the “Elvis Presley of the Balkans” a visit to this museum will take you on a journey through his life where you can see exactly how he loved he was by his country. Just over the road is the local cemetery where his tomb is always covered by flowers and candles. It’s a little morbid, but also quite interesting. 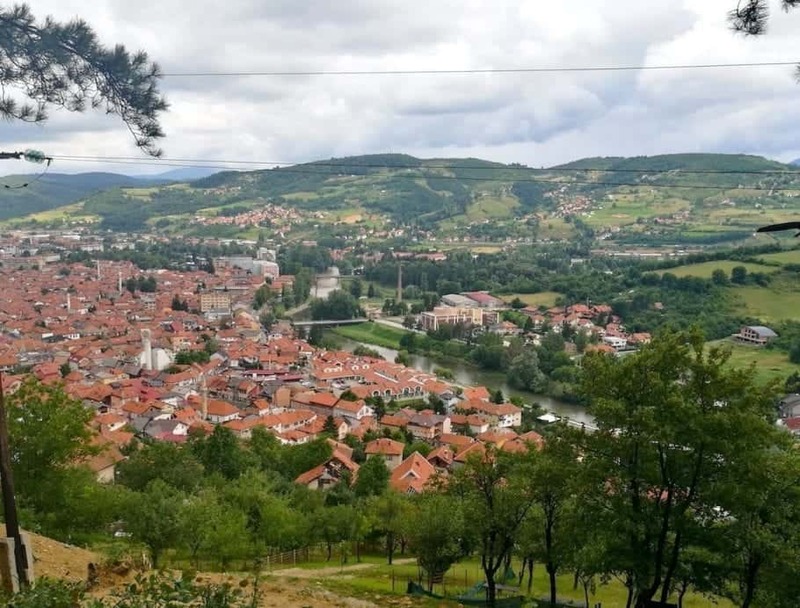 Where to stay in Kruševo: There are no hostels in Kruševo but there’s great private accommodation including Romantique Veles Hotel or Gardenia Hotel & Spa. From the thriving city of Sofia to the black sea coast, and intricate monasteries and fortresses, there’s something for any traveller coming to Bulgaria. Bulgaria has a population of over 7 million and has Ottoman, Slavic, Greek and Persian influences so it’s a melting pot of different cultures and cuisines. Sofia is also one of the oldest cities in Europe and is a popular weekend getaway for many who live in Europe. There are some great places to visit in Bulgaria, have a look below! Transportation: The most popular ways to travel through Bulgaria is by bus and train. Have a look at hiring a car to see some of the best nature and historic spots without the hassle of public transportation! Can you drink the tap water in Bulgaria? Yes, but always check with your accommodation supplier if it’s advised to drink the tap water or not. Accommodation in Bulgaria: There is a range of great hostels and hotels throughout the country depending on your budget. Another great option is Airbnb (Get your free $35 credit here). Plovdiv, the European Capital of Culture for 2019, is a hidden gem that’s bound to explode in popularity after 2019. Compared to the capital city of Sofia, Plovdiv is much more relaxed with cobblestone streets and friendlier locals. There is also a large and well preserved Roman amphitheater on top of a hill overlooking the city. During the summer, they hold concerts, festivals, and other music performances – the ambiance is hard to beat. The Old Town of Plovdiv is also well preserved, as much of the WW2 bombing missed this area. Many of the houses are over 200 years old and have a classic charm to them. The Kapana arts district, which used to be an old area with broken down buildings, is now a rejuvenated area with charming cafes and craft shops. One of my favorite places to chill and spend a lazy day is Art News Cafe. It’s run by English speaking Bulgarians who have spent time outside of Bulgaria. Monkey House is another good option for coffee. They will gladly do a single origin pour over for you! For amazing croissants and baked goods, don’t miss Kapana Bakery. Also for fantastic fresh Bulgarian food with a focus on fresh produce – make sure to check out Pavaj. Where to stay in Plovdiv: If you’re a backpacker you can stay at Hostel Old Plovdiv. If you’re looking for private accommodation, then check out the Landmark Creek Hotel & Spa. Hikers, skiers, spa goddesses and culture vultures can all appreciate one of Europe’s most overlooked mountain ranges. 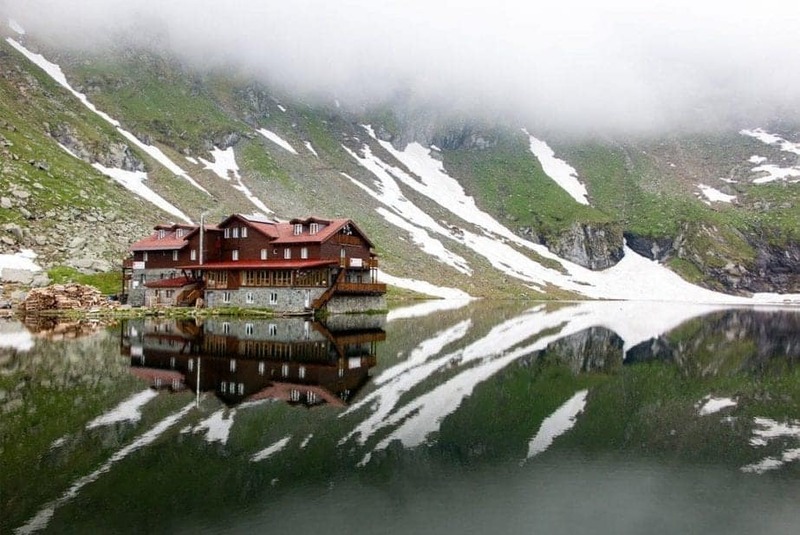 Rila’s landscape is characterised by sunken valleys, alpine meadows, granite peaks and nearly 200 glacial lakes. Only 70km from Sofia, the Rila mountains extend over 2400 square kms and are home to some of the Balkan’s highest peaks, including Mount Vihren (2914m) and Mount Musala (2,925m). Many of the mountains are connected by hiking trails and seasonal mountain huts (summer only). These make the logistics of conquering the Rila summits much simpler, but the steep ascents still require a good level of fitness. Luckily for hikers (and non-hikers), the numerous natural hot springs found throughout the region are perfect for relaxing and resting those wary legs. The region also caters for history buffs as the iconic Rila Monastery is nestled deep in Rila’s alpine forests. This 10th century Orthodox Church is famous for its colourful architecture and beautiful fortress like exterior. During winter the mountains are covered in snow making the area a great spot for skiing. Bulgaria’s second largest ski resort, Borovets, boasts 58km of pistes and a well known apres ski culture. 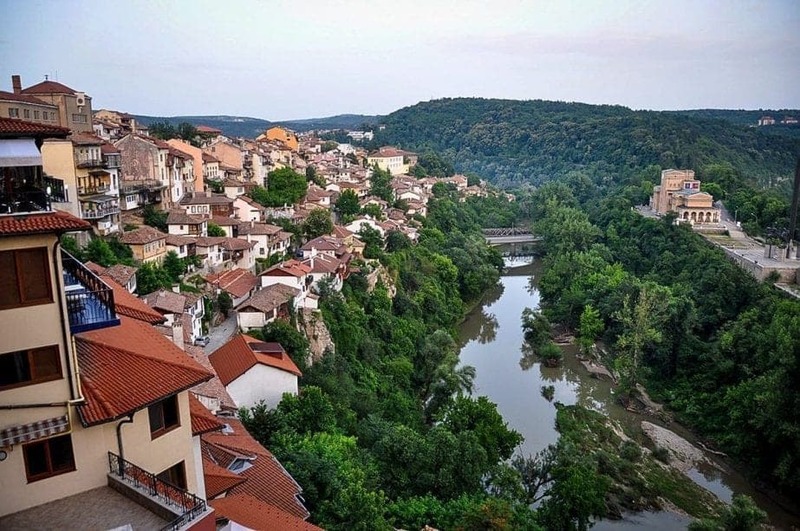 Situated in northern Bulgaria, the town of Veliko Târnovo is bursting with medieval charm. Not only does this small city offer historic architecture and quaint cobblestone streets, but it is home to the second largest university in Bulgaria as well as a thriving expat scene. Veliko Târnovo is a perfect blend of old and new, and is a favorite of both romantics and backpackers. Veliko Târnovo is also conveniently located between Sofia and Bucharest, making it one of the best places to visit in Bulgaria and makes a fantastic addition to any trip to the Balkans. There are plenty of things to do in Veliko Târnovo and nooks and crannies to explore. Start by getting acquainted with the town on the Free Walking Tour. And when your stomach starts to rumble, enjoy a traditional and reasonably priced lunch at the Hadji Nikoli Inn Restaurant. 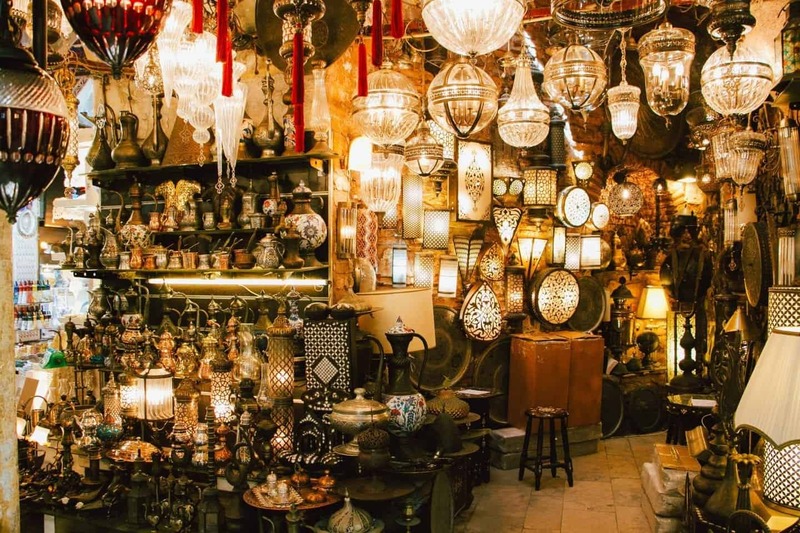 Get lost in the storybook streets lined with shops and cafes. Explore the Tsarevets Fortress by day, and return in the evening if you’re lucky enough to be there during the Fortress Sound and Light Show. Simply find a place with views of the fortress, take a seat and enjoy the laser show free of charge. And if you enjoy trying local drinks on your travels, be sure to order rakia (plum brandy) and cheers to a trip you won’t soon forget! Where to stay in Veliko Tărnovo: If you’re a backpacker you can stay at Hostel Mostel. If you’re looking for private accommodation, then check out the Guest Rooms Tsarevets or Le Rendezvous Apartment. While there’s hardly a Bulgarian who haven’t been to Koprivshtitsa, the small museum-town is relatively unknown to the outside world. 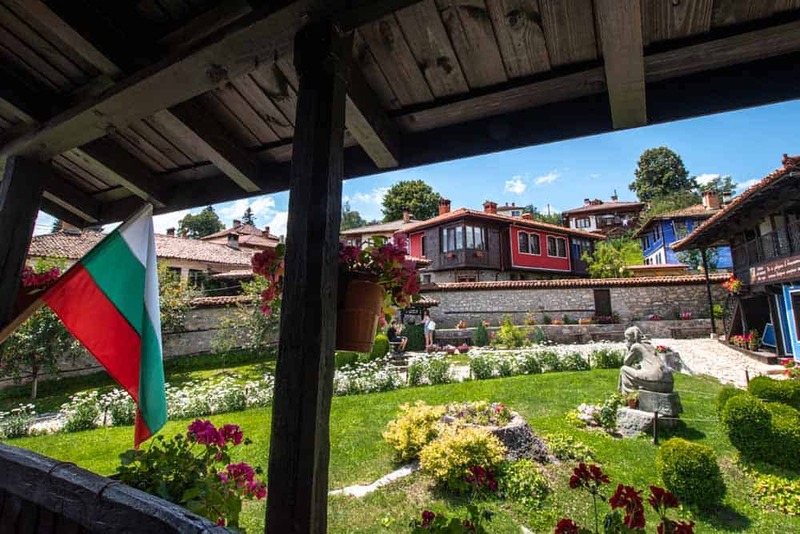 The iconic little town has not only kept its 19th century Revival Period architecture but was also home to some of Bulgaria’s biggest national heroes. Their houses are now turned into museums you can easily explore in a few hours. You’ll not only learn more about Bulgaria, and it struggles with the Ottoman Empire, but you’d also find out how the 19th century Bulgarians used to live back there. Once you’ve seen enough, have a sit in one of the traditional Bulgarian taverns and have some of the best food you can find in the country! Koprivshtitsa’s location is also a very convenient one. The historic town is positioned between the two biggest cities in Bulgaria – Sofia, and Plovdiv, and it’s a perfect day trip getaway. If you visit, make sure to try the legendary crepes with homemade jam! Where to stay in Koprivshtitsa: There are no hostels in Koprivshtitsa but there’s great private accommodation, including Once upon a time. Sofia can be described as one of the most overlooked capitals in Europe, but paying a visit is more than worth it. Located in the Western part of Bulgaria, it is very easily accessible, may it be by car, bus or plane. Nowadays some low-cost airlines offer flights to Sofia at extremely low rates (I am talking 10-20 euros), so what’s better than a cheap vacation in a beautiful place? Sofia’s charm is hidden in its paved streets, cosy restaurants and bars, delicious food and a beautiful view of the mountains nearby. It may still hold the spirit of communism in its residential parts, but the central area is full of landmarks and historical buildings. 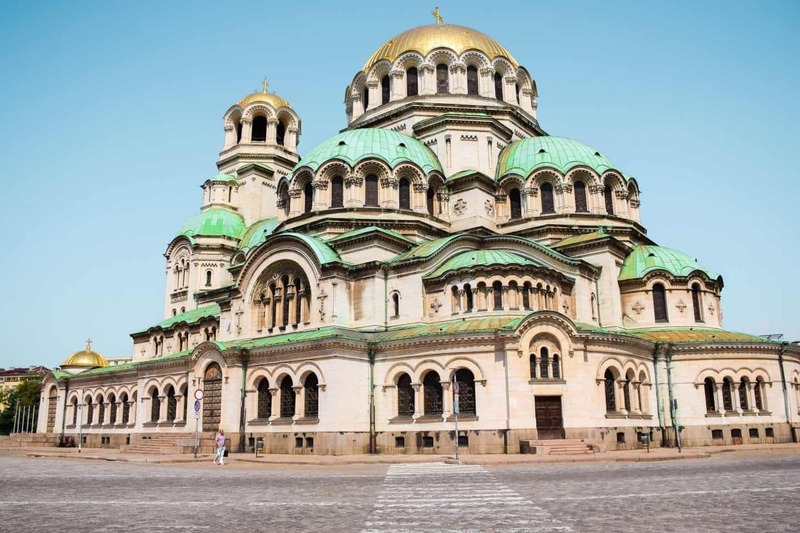 The main attraction of Sofia is the St. Alexander Nevsky Cathedral. This is one of the largest Eastern Orthodox Cathedrals in the world and it fascinates with its beautiful golden domes and impressive size. The good news is, the city is still not a popular destination, which means you won’t come across huge groups of tourists. While you’re in Sofia, make sure to also check out the Ivan Vazov National Theatre, Vitosha Boulevard, NDK and all the cute streets around this area. Where to stay in Sofia: If you’re a backpacker you can stay at Hostel Mostel. If you’re looking for private accommodation, then check out the 5 Vintage Guest House or Magic Castle Hotel. 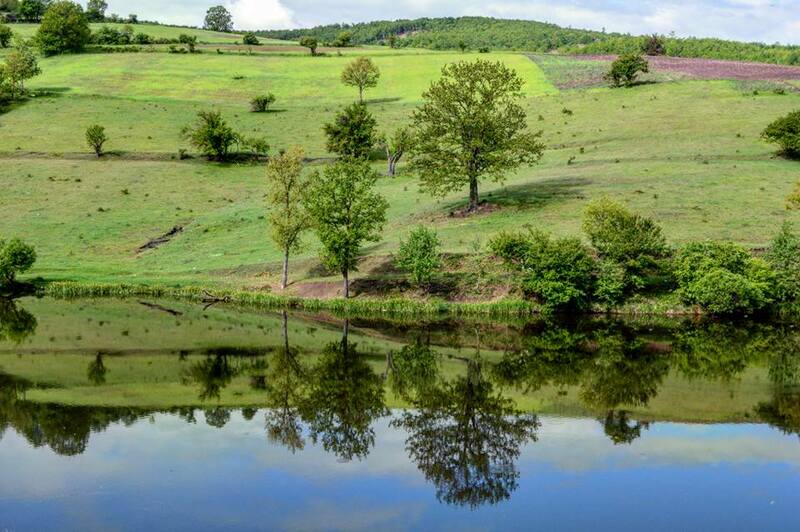 Romania is such an interesting country with many different regions, historic fortifications and natural landscapes. The most popular region within Romania is Transylvania, famous for the story of Dracula. But there’s so many different things to see and places to visit apart from the Dracula castle. In the north, there are the happy graves located in the town of Săpânţa which is a very unique thing to see. 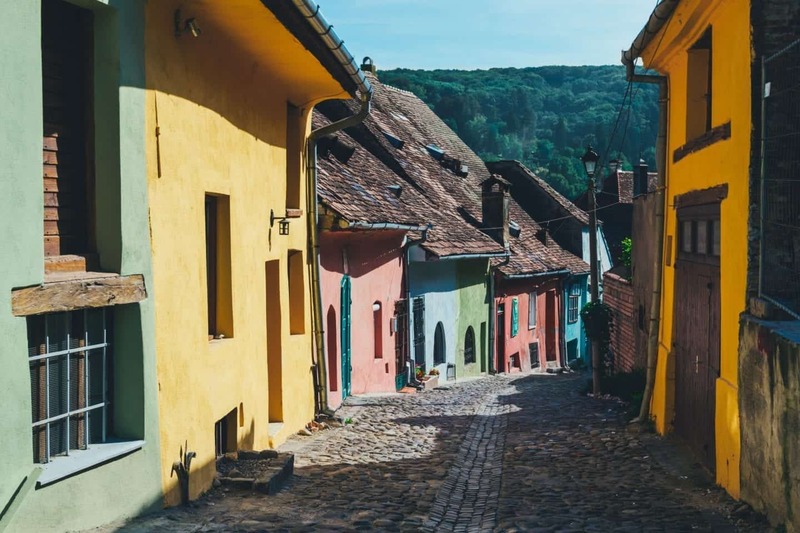 Another must-see within Romania is the beautiful medieval town of Sighisoara or the buzzing student city of Cluj-Napoca. There are lots of options for people coming to Romania. Transportation: The most popular ways to travel through Romania is by bus and train. The trains are not the best but an experience to have during your travels. Can you drink the tap water in Romania? Yes, but always check with your accommodation supplier if it’s advised to drink the tap water or not. Accommodation in Romania: There is a range of great hostels and hotels throughout the country depending on your budget. Another great option is Airbnb (Get your free $35 credit here). The city of Bucharest has a certain charm about it. Many fall in love with Bucharest because there is so much to do there including visiting the old town, learning more about the communist history, people watching at one of the many cafes or gazing at one of the many beautiful churches. Bucharest also has a thriving food scene with many great restaurants scattered throughout the city. You can find a great mix of hearty Romanian food but also there’s an emerging international food scene. 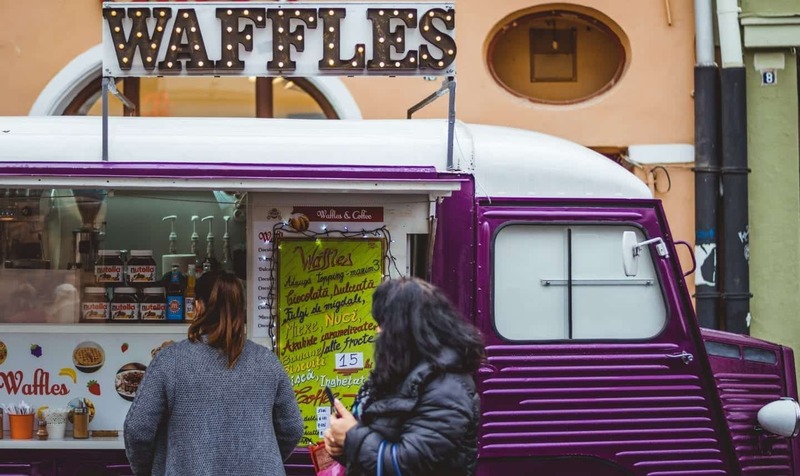 A great way to dive into the food scene is by taking a food tour in the city! 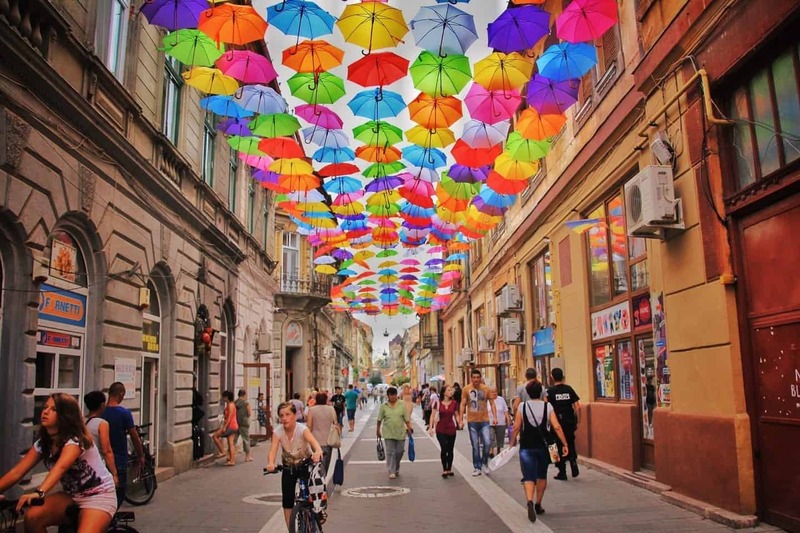 Where to stay in Bucharest: If you’re a backpacker you can stay at Podstel Umbrella Hostel. If you’re looking for private accommodation, then check out the 5 Vintage Guest House or Magic Castle Hotel. This medieval town is famous for its Germanic architecture and it’s a great stop if you’re travelling through Transylvania. Be sure to check out the square to gander at the beautiful architecture and people watch. If you love architecture and interior design, then check out the Orthodox cathedral. It’s one of the most beautiful cathedrals I have visited filled with beautiful murals inside. Wander through the lower town while you’re there. The decaying beautiful buildings were a highlight for me in Sibiu. Where to stay in Sibiu: If you’re a backpacker you can stay at B13 Hostel. If you’re looking for private accommodation, then check out the Artisans Boutique Villa or Anna Central Studio. Brasov is known for its cobbled streets, gothic architecture and being so close to the famous Bran castle (Dracula’s castle). I highly recommend a stop in Brasov for a few days as there is a lot to do within the city as well as nearby! This city is also famous for its skiing in the winter so it’s a popular getaway for winter sports enthusiasts. You can catch the cable car or hike to the top of the mountain which sits behind Brasov for an amazing view. A great thing to do is the free walking tour so you can get a good insight into the features and history of the city. Nearby I highly recommend a trip to Rasnov. Bran castle is incredibly touristy and very expensive when you compare it to the other castles within Romania. In Rasnov you have Râșnov Fortress which is beyond beautiful and worth a look. The view from the castle is stunning, you could easily spend a couple of hours here. There are also great restaurants within the town which serve traditional local food. A day trip to Rasnov is highly recommended! 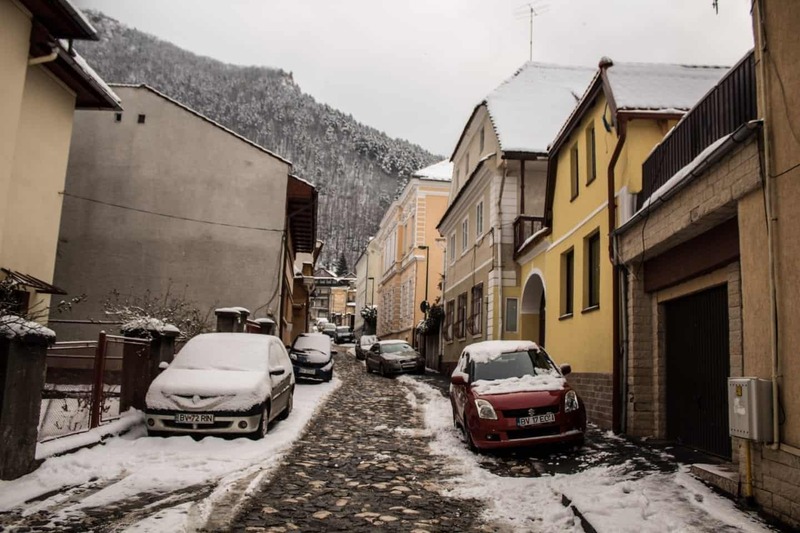 Where to stay in Brasov: If you’re a backpacker you can stay at Kismet Dao Hostel. If you’re looking for private accommodation, then check out the Quiboo or Arce Boutique Hotel. The sweet historic city of Sighisoara is worth the trip, trust me! This beautiful gothic town has a charm like no other. Wander around the old cobbled streets gazing at the colourful houses that line the narrow streets. Make sure you visit the church at the top of the hill in the old town to get a nice view. You can also climb the clock tower in the centre for an insight into the city’s history as well as a great view. 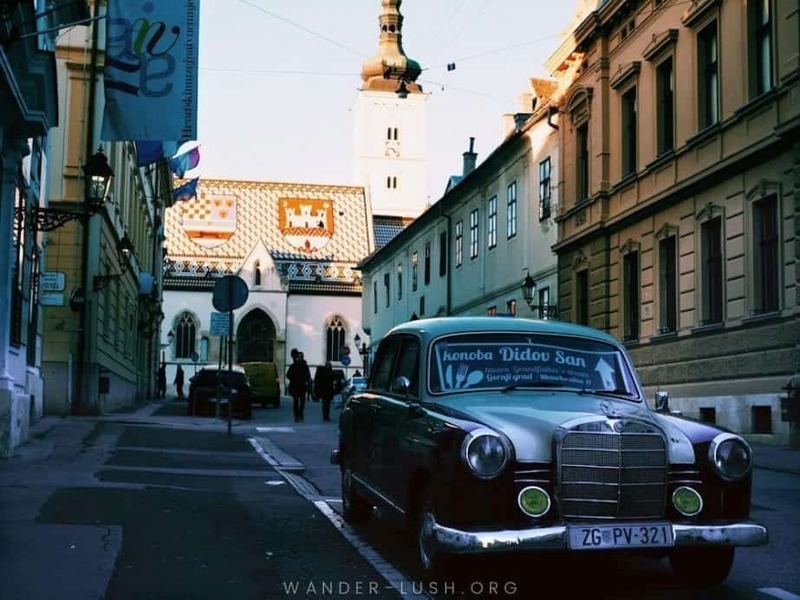 Where to stay in Sighisoara: If you’re a backpacker you can stay at Burg Hostel. If you’re looking for private accommodation, then check out the Fronius Boutique Residence, a beautiful accommodation set in a historical house and possibly the BEST breakfast in town! If riding one of the most unique roads in the world sounds like a good idea to you, then you need to look at the Transfagarasan Highway. Described even by Jeremy Clark of Top Gear as one of the most beautiful roads in the world, the highway crosses a major mountain range in Romania and does so in wild hairpin bends. Not just that, though. The road is lined with waterfalls and stopping points for you to admire the scenic views. At the very top, you can watch in awe how a glacial lake beautifully reflects everything around it including streaks of snow. The road opens just from June until October, as during autumn, winter and spring the conditions don’t make the road accessible. It’s still possible to get up there in a cable car, though, and even stay in an ice hotel that is constructed every year anew. 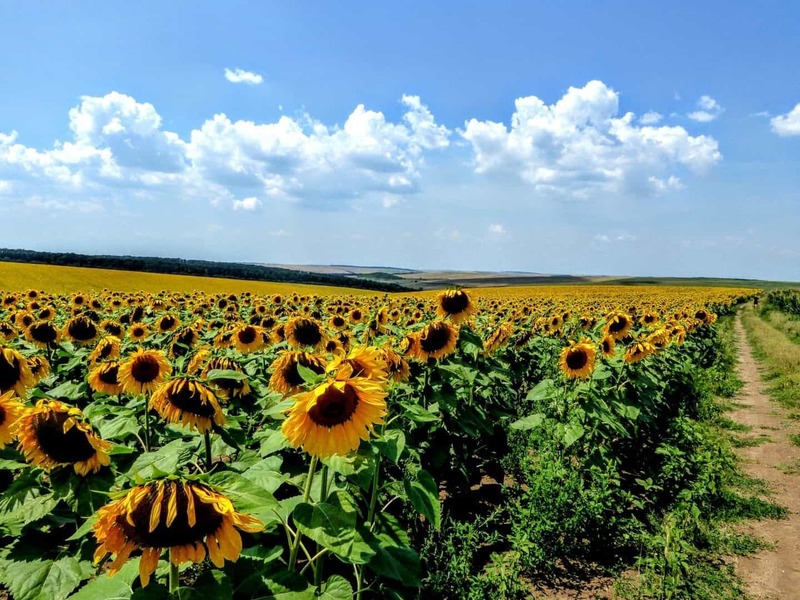 The road can be found between Bucharest and Sibiu and is the fastest route to take between the two cities, since they are cut off from each other by the Fagaras Mountains. The country of Greece is well-known for holidaymakers for having some of the most beautiful islands in Europe and in the world. Greece is already a loved destination for people in Europe. It’s not only known for its beautiful views but also its food! The food in Greece is some of the best and most delicious in the Balkans and in Europe. Make sure you try souvlaki, a wrap with kebab meat, tzatziki, onions and chips. Also, try Dolmadakia (Stuffed Grape Leaves), they are delicious! Let’s get into the best places to visit in Greece below. Transportation: You can travel through Greece by bus or train easily. To get to the various Greek islands you can take a ferry or sometimes fly depending on which island you would like to visit. Can you drink the tap water in Greece? Yes! Accommodation in Greece: There is a range of great hostels and hotels throughout the country depending on your budget. Another great option is Airbnb (Get your free $35 credit here). One of our favourite places in the Balkans to visit is Thessaloniki in North Greece. Thessaloniki is Greece’s second city, and also considered the country’s cultural capital. For example it has many different festivals and events taking place throughout the year, such as the Hip Hop Festival, Film Festival, Documentary Festival, Photography Festival Book Fair and many more. The most iconic and recognisable part of Thessaloniki is the 34m high “Lefkos Pirgos” (“white building/tower”) located right by the seafront. It used to form part of the defensive walls surrounding the city. In addition, the seafront has a popular and bustling promenade that runs from the White Tower all the way to the port. This is our favourite part of Thessaloniki – it’s a popular meeting spot, with many excellent cafes and bars to hang out. Further in from the seafront is the old part of the city, which has lots of cute cobblestone streets lined with orange trees. Here you find some of the best traditional Greek tavernas like “Prytanio”, “Kanoula” and “Tripia Potiria”. The city also has lots of Byzantine monuments to check out like the “Paleochristian”, and fascinating museums like the historic home of Atatürk (founder of modern Turkey). Thessaloniki has an international airport with daily flights to most part of Europe. If arriving by train, the city’s main train station is located in the heart of the city. Where to stay in Thessaloniki: If you’re a backpacker you can stay at Crossroads. If you’re looking for private accommodation, then check out The Caravan or Downtown Happy Living Pnv’s Home. One of the most underrated places I have ever visited in the Balkans is Aegina, Greece. 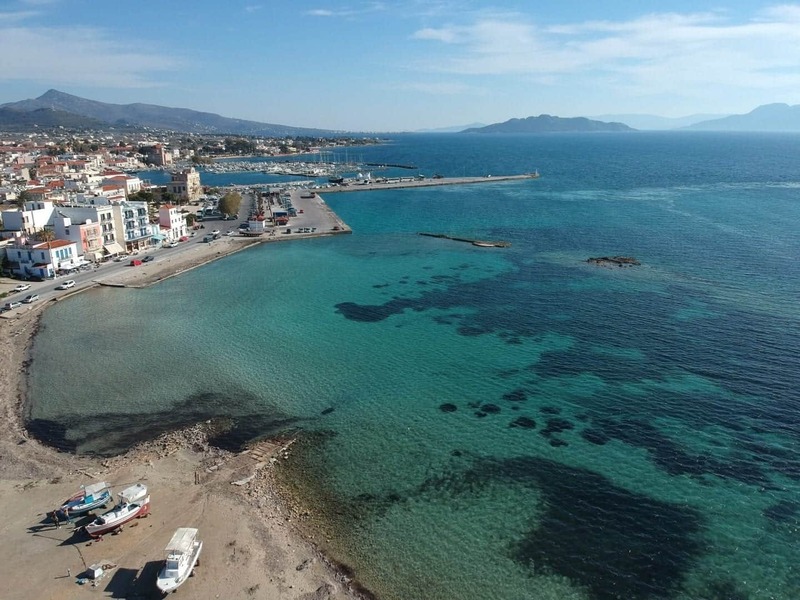 Aegina is just a short ferry ride away from Athens, the Greek capital city, yet it feels like it is lightyears away. 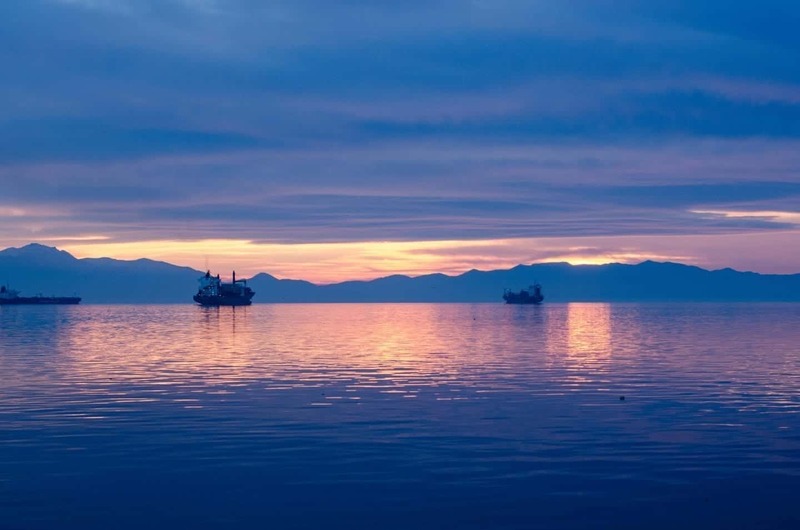 Taking the Athens to Aegina ferry is a simple process if you plan accordingly and ahead of time. There are a few ferry options daily and you can get there as cheaply as $8 or so. Once you’re in Aegina, you will be pleased to know that the seafood is outstanding and the islands main claim to fame is pistachios. The pistachios on Aegina are recognized by the European Union and are also the only place in Greece that grows them. Another sight worth visiting on Aegina is The Temple of Aphaia which was built in around 500 BC. The island is not overly large and all parts of it can be reached by taxi or rental car with no issue. There is also public transportation available if you are interested in taking a slower approach to travel there. 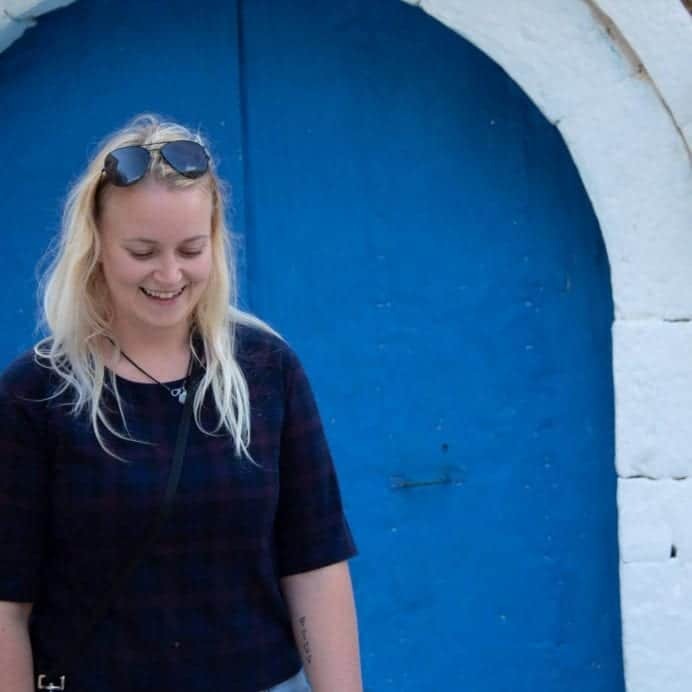 I found the island particularly relaxing and chilled out compared to other places in Greece and I think it would be remiss of people to travel to Athens and not take a day trip via ferry to Aegina. Where to stay in Aegina: If you’re a backpacker you can stay at Rachel Hotel. If you’re looking for private accommodation, then check out Ellanion Studios or Aqua N.J.V. If you are going around the Balkans, Athens is one of the places you must visit. A bustling city of just under 4 million people, Athens offers a combination of ancient sites, Byzantine churches, modern neighborhoods, plenty of street art and a lively vibe at all times of day and night. Whether you are interested in history, shopping, nightlife or food, Athens will not disappoint you. Most tourists have heard of the Acropolis and the Acropolis Museum. However, there are many more archaeological sites to visit. If you have three days in Athens, you should definitely visit the Ancient Agora, the Kerameikos cemetery, the Temple of Zeus, and at least one museum, such as the National Archaeological Museum. Go up Areios Pagos, Filopappou hill and Lycabettus hill to admire the views – or simply have a drink in one of the numerous rooftop bars around Monastiraki or Acropolis metro stations. In terms of modern culture, you will find that Athens has a unique lively vibe. 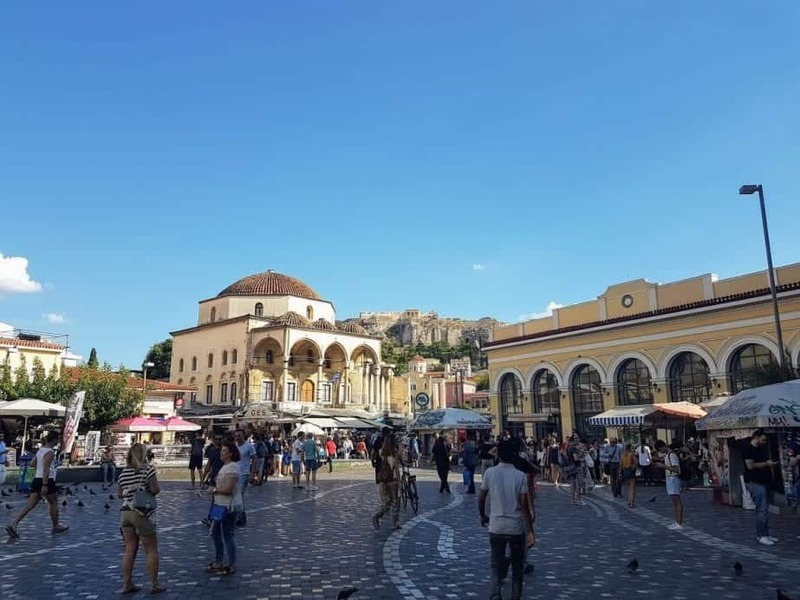 There are plenty of markets and shopping areas to explore, such as the flea market in Monastiraki, the souvenir shops in Plaka area, and the central market just off Psirri area. If you want a glimpse of local life, make sure you include those in your itinerary. Last but not least – indulge in delicious Greek food. You can fly into Athens from most international airports, or take a bus/train from most of the other Balkan countries. Where to stay in Athens: If you’re a backpacker you can stay at Bed Station. If you’re looking for private accommodation, then check out Elia Ermou Athens Hotel or City Circus Hotel. 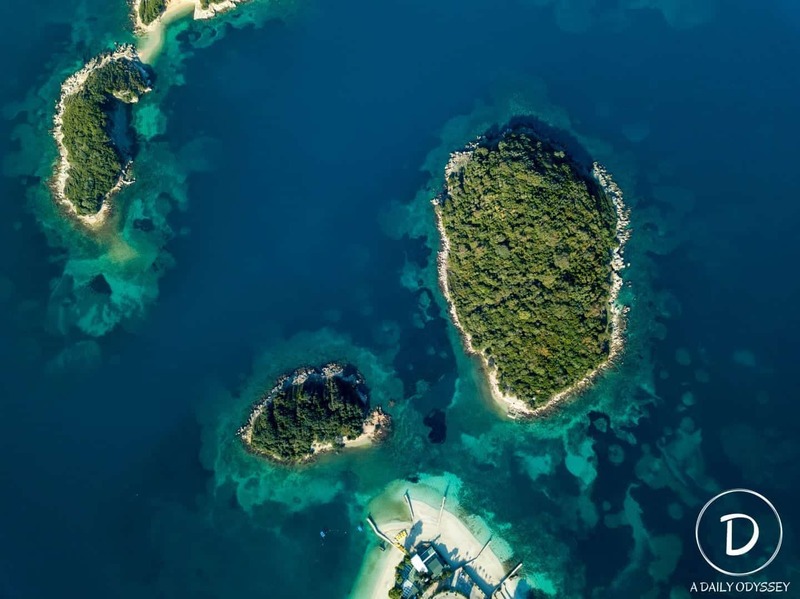 Very close to Tesalonika, an important and lively Greek city reachable by plane, train, car or ship; the region of Halkidiki stands as one of the most unknown in Greece, even though it has so much to offer its visitors all year round. Already relevant in ancient Greece, this historic region on the outskirts of Central Macedonia, has important tourist attractions such as the sacred Mount Athos (only accessible to men, although everyone can appreciate its beauty from one of the tourist boats that daily are as close as possible to their coasts), the beaches of the Sithonia and Kassandra peninsulas in the Aegean sea (known for its incredibly picturesque islands) and the small – but very charming – population of Stágeira, the birthplace of the classical philosopher Aristotle among many others. If you are looking forward to a quiet holiday, I’d recommend you to visit during the shoulder months (Spring and Fall), as in Summer its most stunning spots can feel a bit crowded. Enjoy! If you’re planning a trip to Greece while you’re in the Balkans, you shouldn’t forget about the island of Rhodes This historic island is part of the Dodecanese Islands, a cluster of islands nearer to Turkey than Mainland Greece. While virtually all Greek islands offer history and culture, Rhodes is perhaps the best island for history lovers. The Old Town of Rhodes is a UNESCO World Heritage Site and it is in fantastic condition. Walking around the Old Town and seeing historic sites such as the Suleiman’s Mosque and Ippokratous Square is simply magical. History lovers also shouldn’t miss the Palace of the Grand Master or the Acropolis of Rhodes, two essential sites in Rhodes. Also, Rhodes was the site of one of the former Ancient Wonders of the World, the Colossus of Rhodes – a massive statue guarding a beautiful bay. While this no longer exists, visiting the place where it used to stand is still quite popular among history buffs, and you can see where a pillar marks the place it historically used to stand. 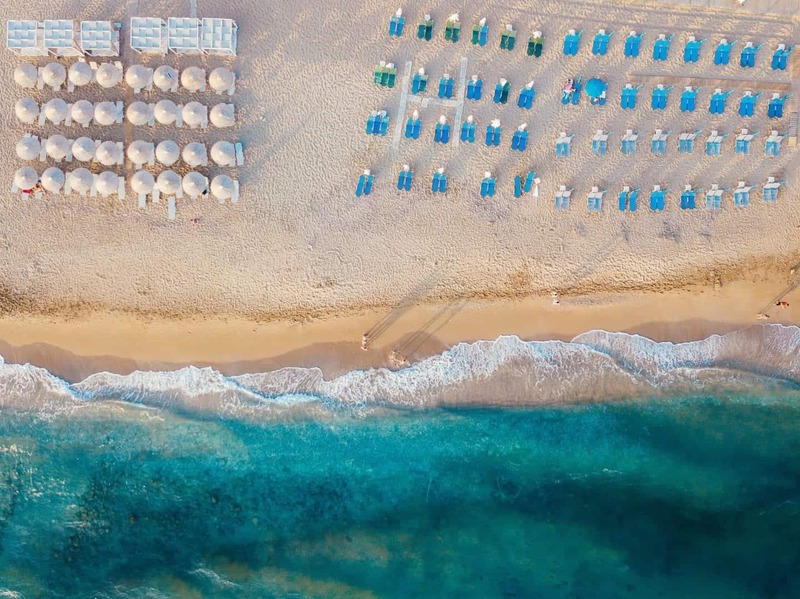 However, Rhodes is far more than just its historical sites – beach bums will find plenty to enjoy on this Greek island as well! The seaside town of Lindos is that quintessential white-washed Greek beach town that is as photogenic as can be. But better yet, it’s right next to one of the most beautiful beaches in Greece, Lindos Beach, which offers a calm bay filled with glassy turquoise waters, plenty of beach chairs to relax in, and even boat trips around the island. Where to stay in Rhodes: If you’re a backpacker you can stay at Stay Hostel or Rhodes Backpackers. If you’re looking for private accommodation, then check out Helios Garden Boutique Apartments or Kókkini Porta Rossa. Many are surprised that Turkey is technically in the Balkans. Turkey lies on two continents – Europe and Asia. The Europe side sits within the Balkan peninsula. Turkey is a vast country with lots of history and things to do. It’s full of natural sites, UNESCO sites, buzzing cities, beautiful beaches, islands and more, so it’s a great option to end or start Balkans travel. Transportation: You can travel through Turkey by bus or train easily. The country is big so sometimes flying internally is recommended. Can you drink the tap water in Turkey? No, throughout most of the country. Istanbul usually has safe drinking water but it’s always best to check with your accommodation. Accommodation in Turkey: There is a range of great hostels and hotels throughout the country depending on your budget. Another great option is Airbnb (Get your free $35 credit here). Istanbul is a buzzing city and popular with travellers as there are lots to see, do and eat. It also has two airports with relatively cheap flights, making it a great start to a holiday in Turkey. 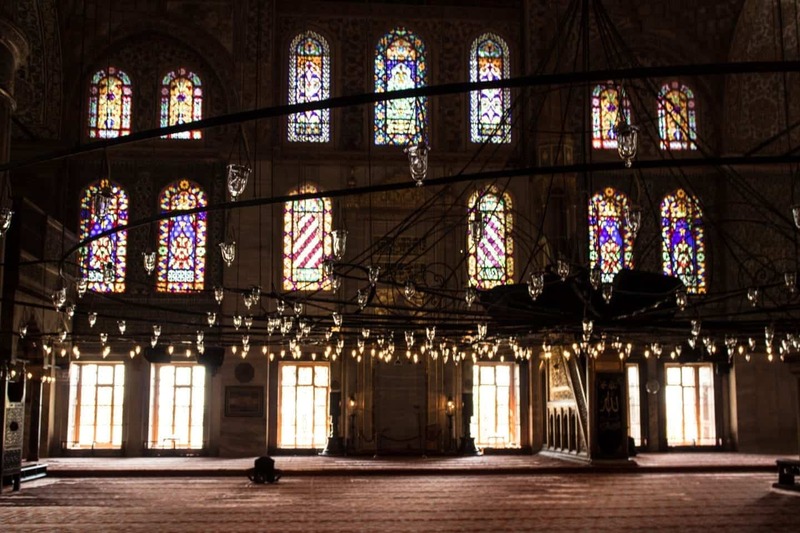 Make sure you visit the blue mosque, which is the biggest mosque in the city. The architecture of this building is stunning and it’s guaranteed to blow you away, even if you’re not religious. Make sure you wear appropriate clothing otherwise you won’t be allowed to go inside. They do have cloaks that you can wear if you’re not suitably dressed. Another great thing to do in Istanbul is to go to the Bosporus river and grab a pickle juice with a fish sandwich. This is a popular lunch for the locals and is delicious. Where to stay in Istanbul: If you’re a backpacker you can stay at Avrasya Hostel. If you’re looking for private accommodation, then check out Celine Ottoman Mansion or Katelya Hotel. The land of the most unusual landscapes, maybe ever! Cappadocia is rich in history and has a unique feature – rock formations that look like chimneys! 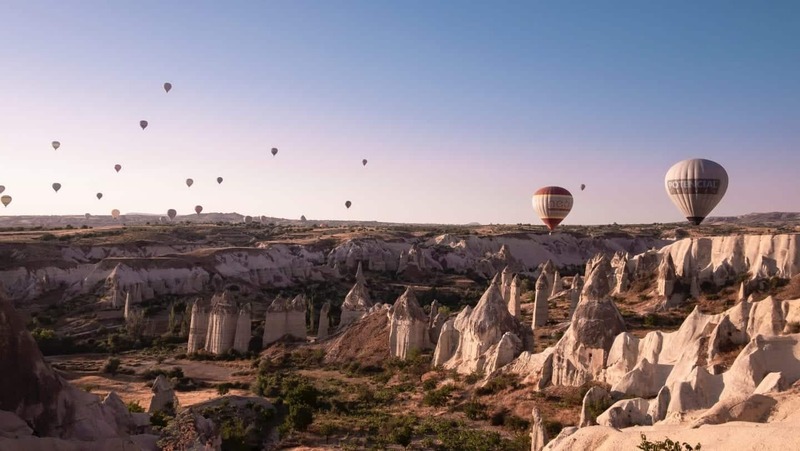 They are called fairy chimneys and can be seen throughout Cappadocia. The rock formations were caused by multiple volcanic eruptions in the area. The history aspect of Cappadocia is really fascinating as well. Make sure you visit the Goreme Open Air Museum where you’ll get a first-hand look into life living in one of the chimneys. There are ruins of houses, monasteries and churches! Cappadocia is a listed UNESCO site and one of the most popular in Turkey. One of the most common activities for people coming to the area is to take a hot air balloon ride over the region. Where to stay in Cappadocia: If you’re a backpacker you can stay at Castle Inn. If you’re looking for private accommodation, then check out Hanzade Suites or stay at one of the most luxurious hotels in Cappadocia, and in Turkey – Museum Hotel. 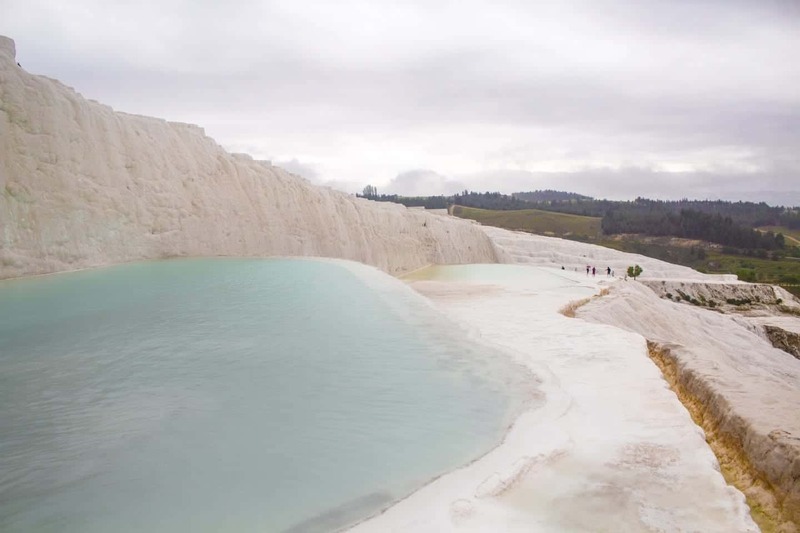 Another famous and beautiful natural site is the white stoned terraced hot pools of Pamukkale. These are naturally formed hot springs. Pamukkale translates to cotton candy and you can see why when you visit! Over the years there has been a lot of damage to these pools, so much so that some of them have turned yellow. Luckily these days they have started to conserve them and hopefully, the can recover over the years. I highly recommend a visit to this UNESCO site while you’re on holiday in Turkey. Where to stay in Pamukkale: If you’re a backpacker you can stay at Ozenturku Pansiyon Hotel. If you’re looking for private accommodation, then check out Venus Suite Hotel or Hotel Pamukkale. Look at those classic waters Anita 😉 Brilliant imagery. I dig knowing bus rides are the main way to get around this region. 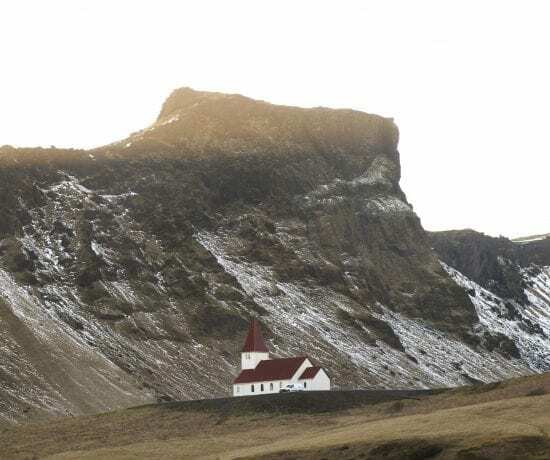 I love a good bus ride here and there and don’t mind longer trips if the seats are comfy, and if the roads are not too rough. Even if things get hilly or a bit hectic I still enjoy busing as opposed to flying for medium-length trips. Wow well done Anita, the most amazing explanation of this regions I ever seen and believe me not even people of Balkan or Kosovo like me could have ever done it in such a way or better. You are such a highlight to the travel guide out there and tourism industry for Albania in particular that I salute you. Keep up the good work and for those of you who want to know about the safety of Albania and Kosovo especially There is no safer place in the World to live and also to visit with locals, you might just not want to leave ever.